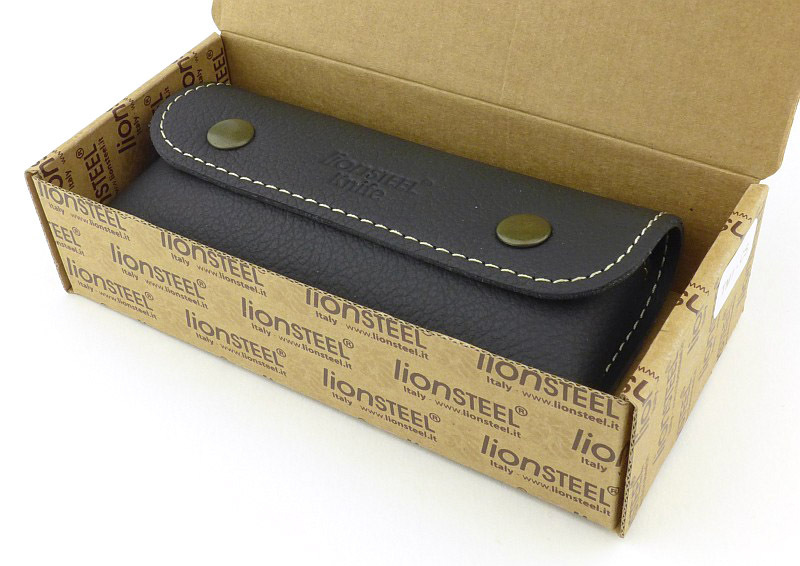 Lionsteel are a brand that stand out year-on-year thanks to maintaining a superb level of manufacturing quality over a wide range of knife designs, both fixed and folding. 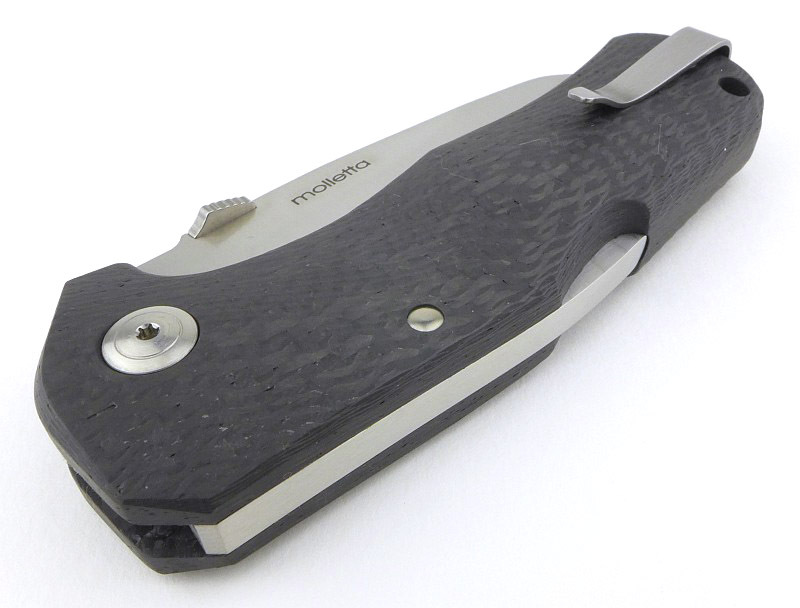 This review takes a look at the Carbon Fibre version of the TM1 folding knife. 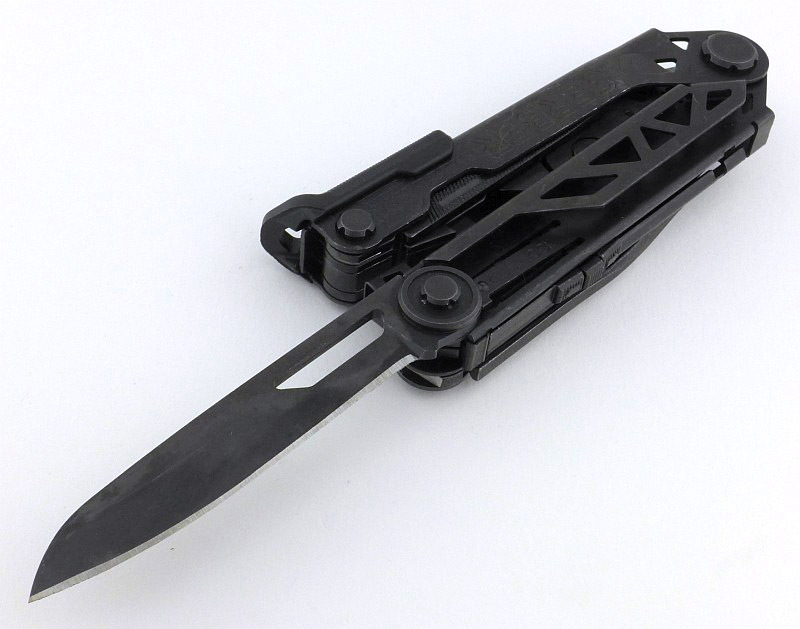 Like the outstanding SR-1 (which is still going strong eight years after its launch), with its impressive construction using a one-piece handle, the TM1 also uses this single-piece handle design, but instead of an integral lock it uses a more traditional back-lock. 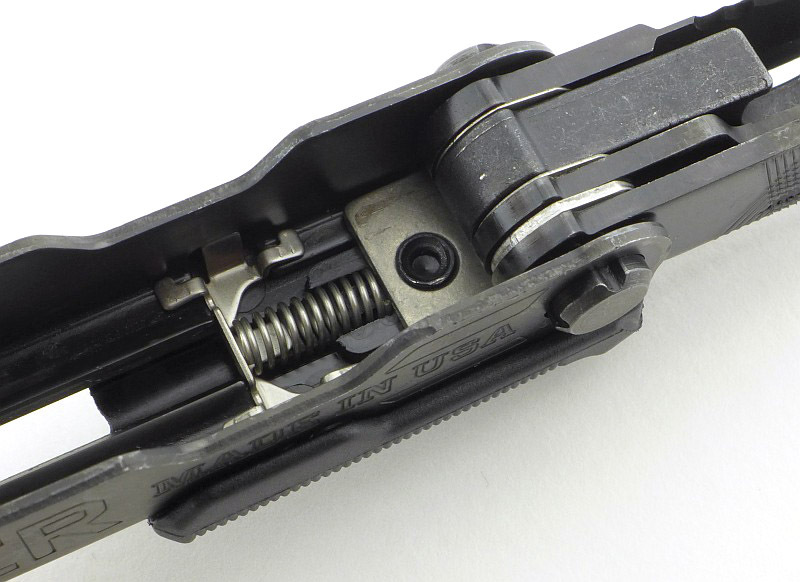 I like an integral lock as much as anyone, but I am having just a little too much of them, and find it refreshing that the TM1 uses a back-lock. 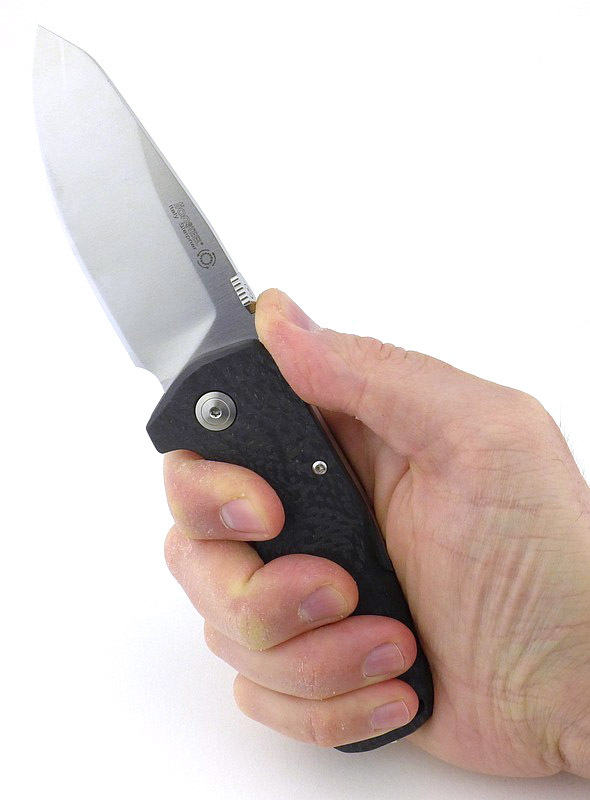 One main advantage of this is that the handle shape, grip and feel is not compromised by the lock-bar. 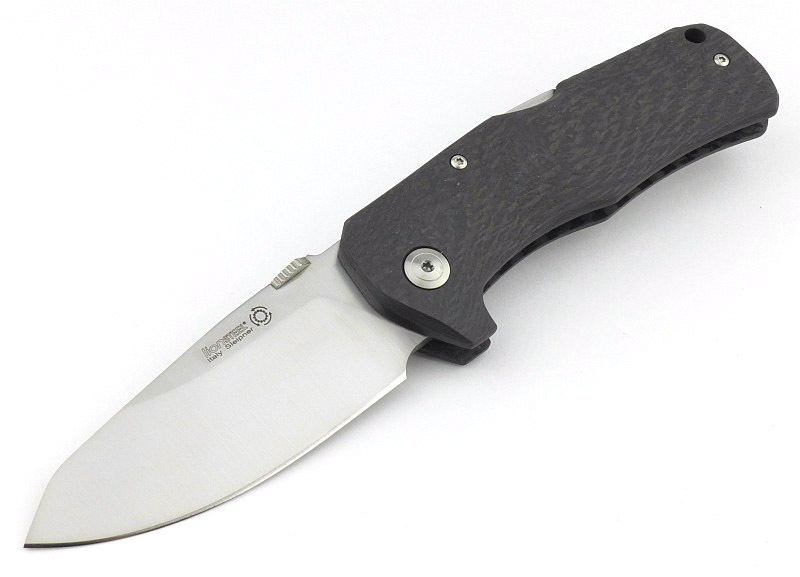 Still a heavy folder, like the SR-1, but with a very interesting reverse-tanto blade shape, and a handle with two non-metallic material choices – Carbon-Fibre or Micarta. Finding this knife was one of my show highlights from IWA 2018. 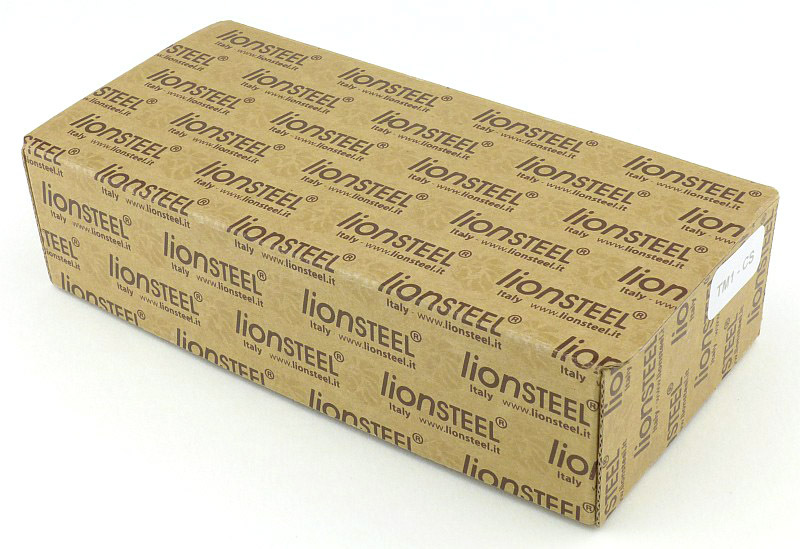 The TM1 comes in a familiar Lionsteel cardboard box. 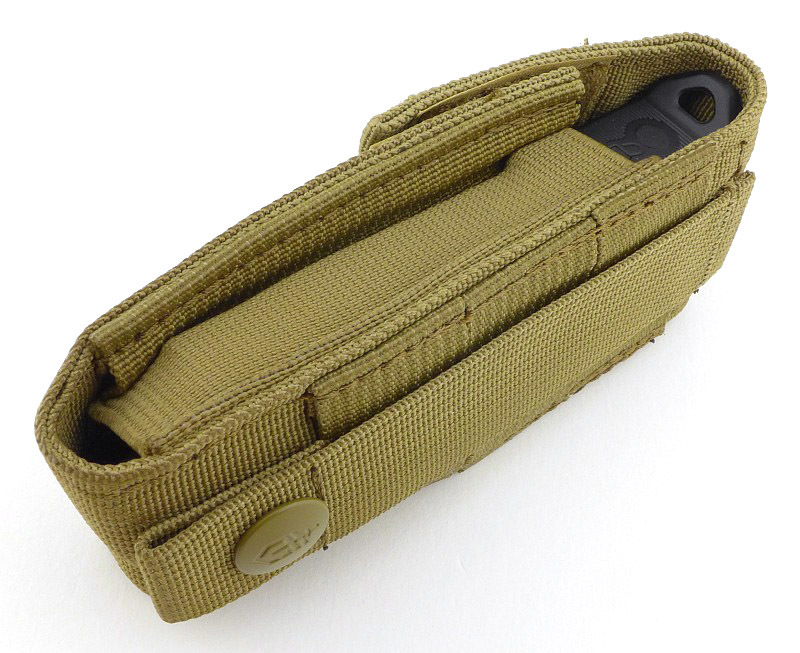 Inside the box, the TM1 is in a pouch / carry case which can slide onto a belt as a horizontal pouch. 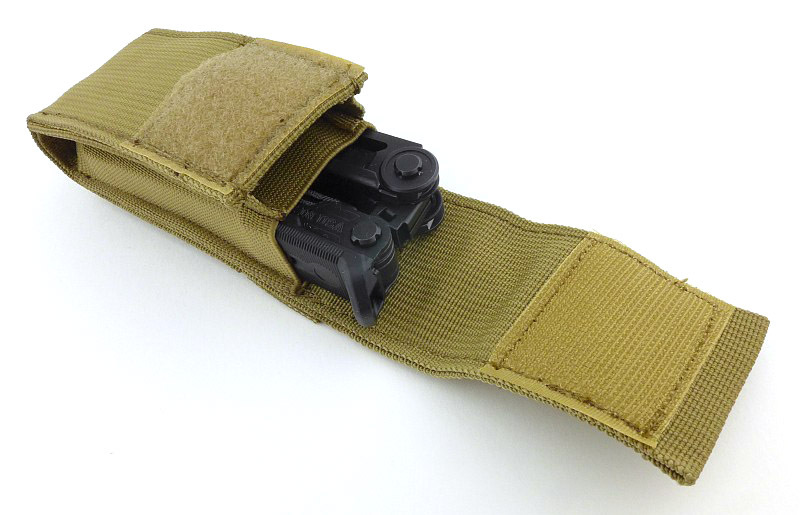 It will only fit over a slim 1″ belt and this might be a happy accident rather than an intended design feature. 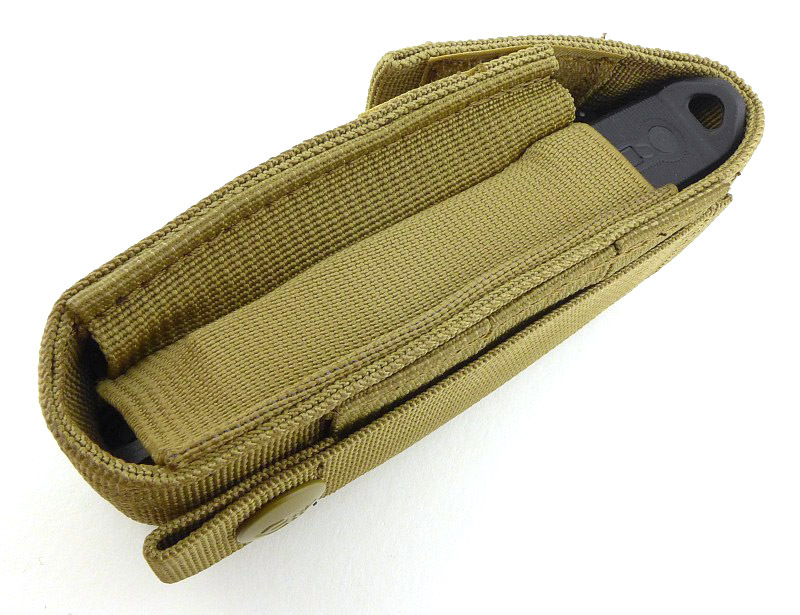 The TM1 arrives in a belt pouch. 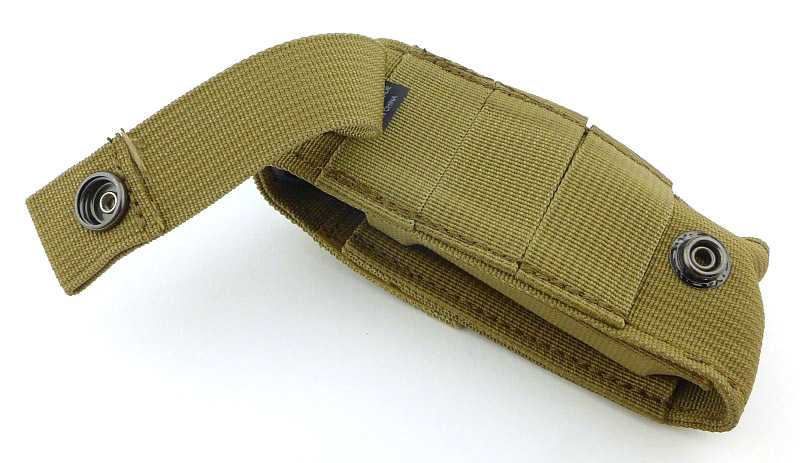 Though not immediately obvious there is a belt channel across the back of this horizontal belt pouch. 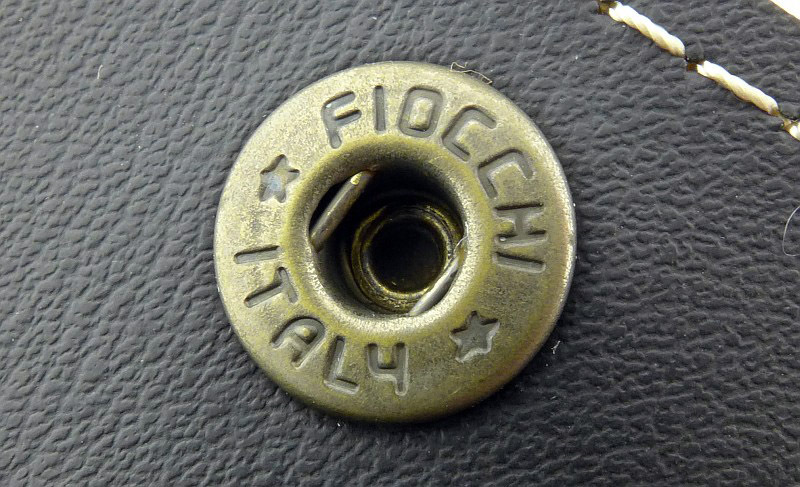 Fiocchi press-studs are used (I believe Fiocchi have stopped making these now). 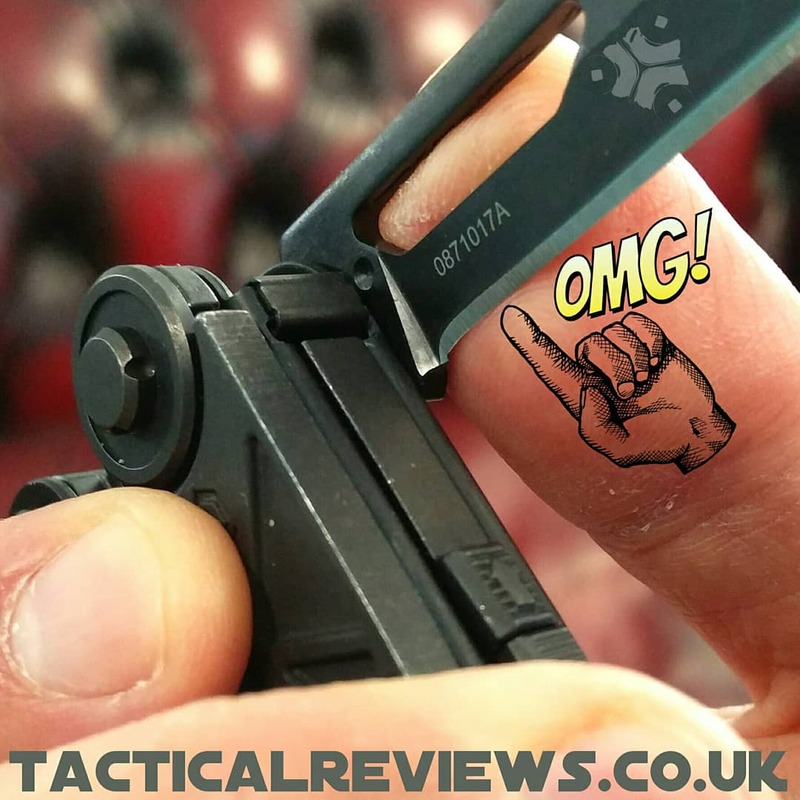 The key images have captions; there is a lot to see on the TM1, so keep an eye out for the handle contouring, clip and glass breaker, ramped thumb opener, crisp finish and other design details. 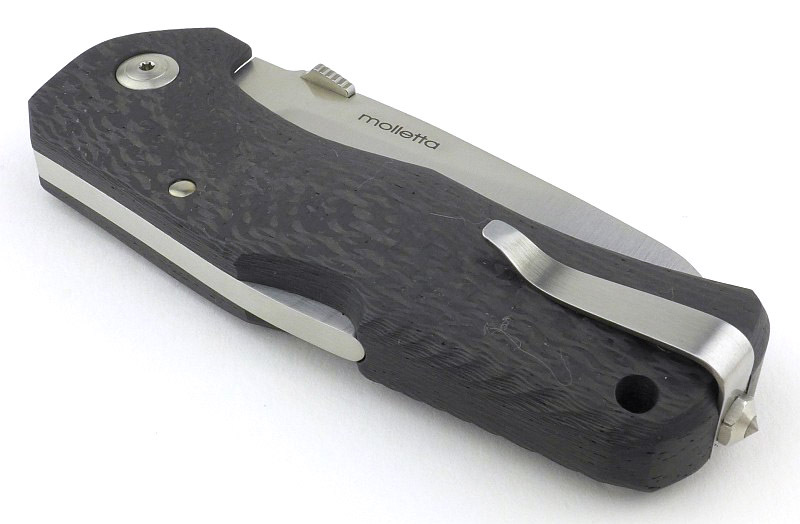 The TM1 is an elegant folder with smooth flowing lines. 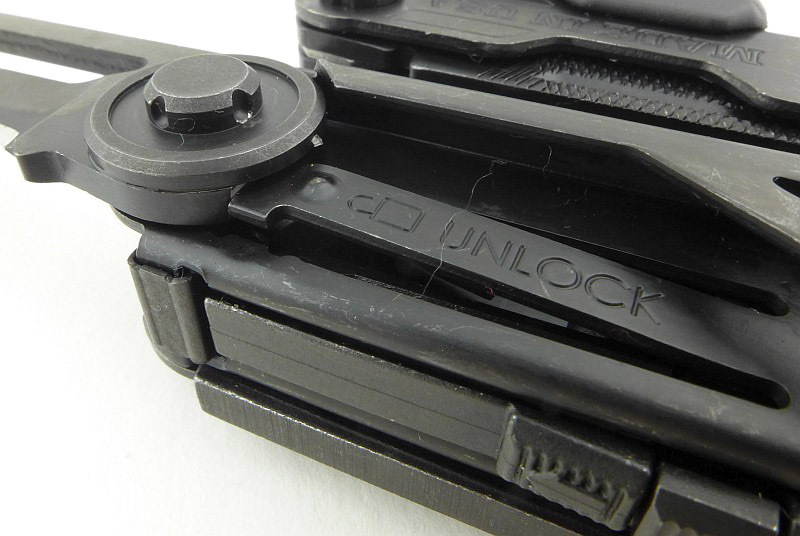 Yes, this is a back-lock, providing an alternative to plethora of integral locks. 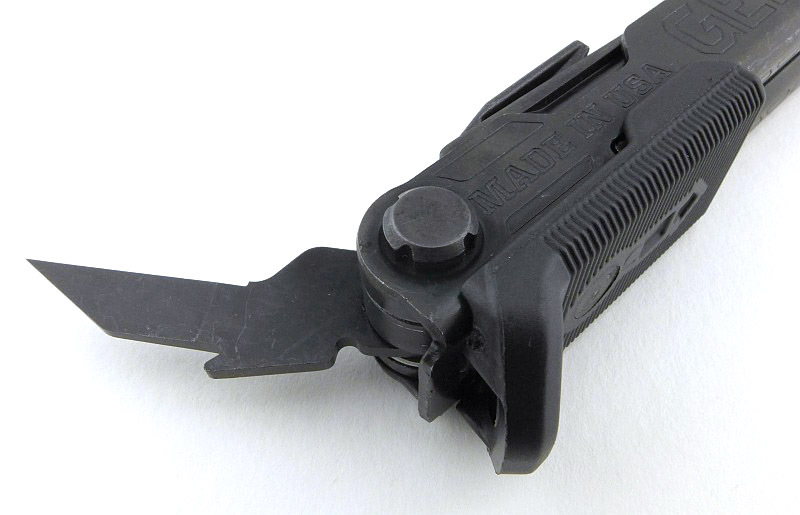 A short pocket clip is held in place with a glass breaker tipped bolt. 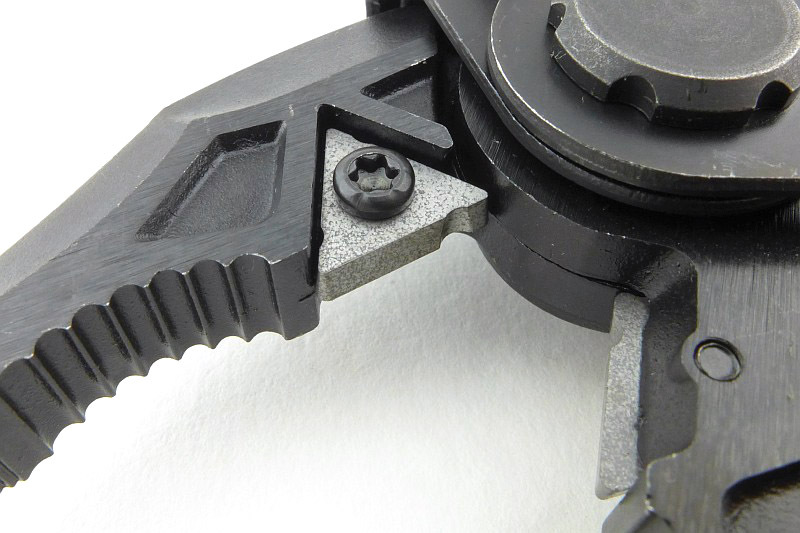 The pivot bolt has a torx fitting. 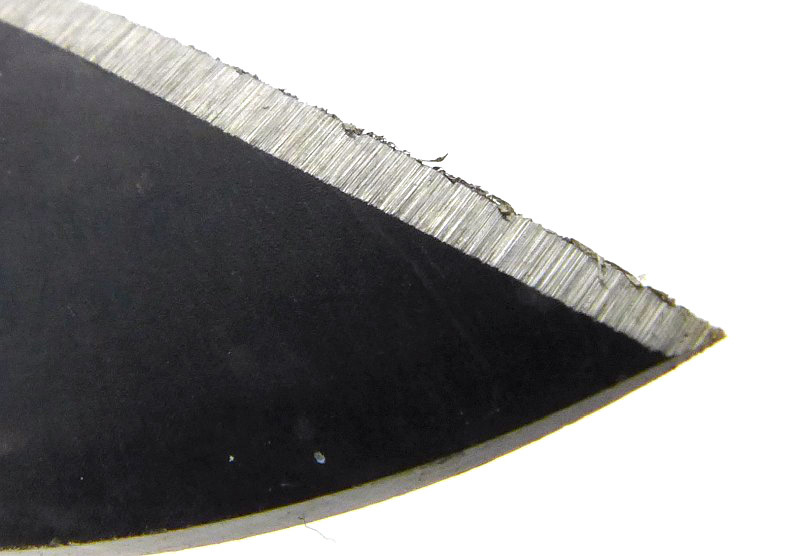 No corners are cut with the handle shaping. 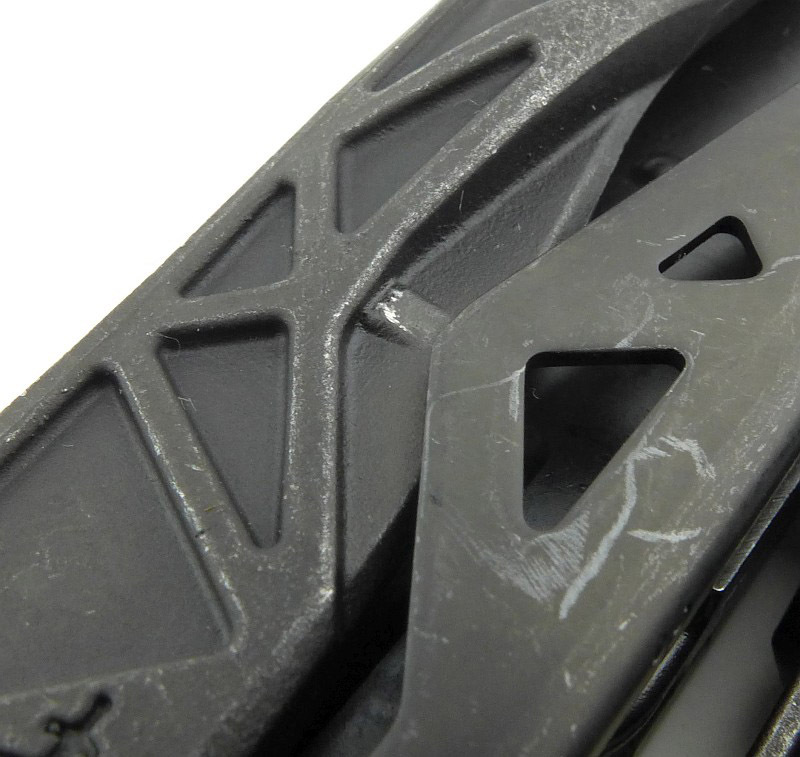 Full 3D sculpting creates a fully organic shape with subtle grip texturing. Surprisingly this short clip actually works really well and hasn't felt too stiff. 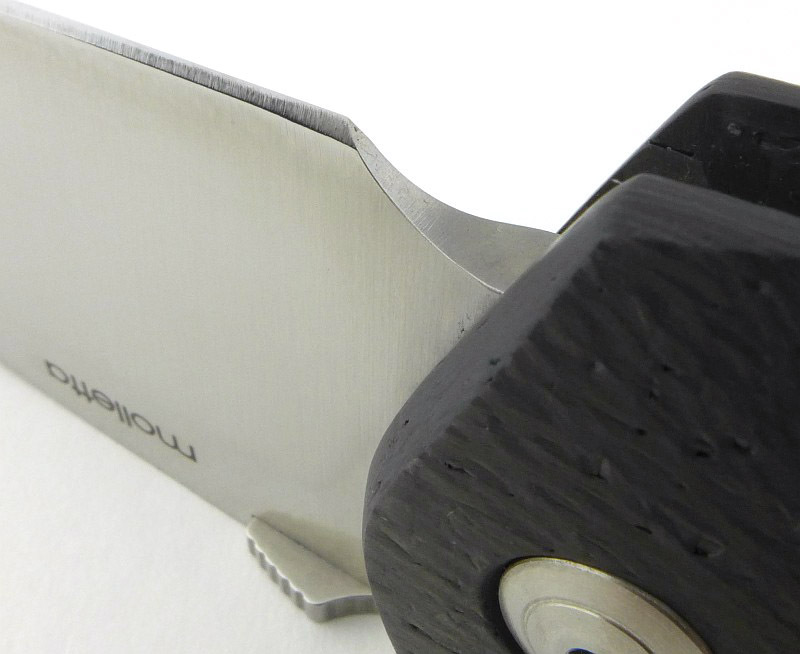 A ramp shaped thumb opener is bolted to the blade, so could be removed if required. 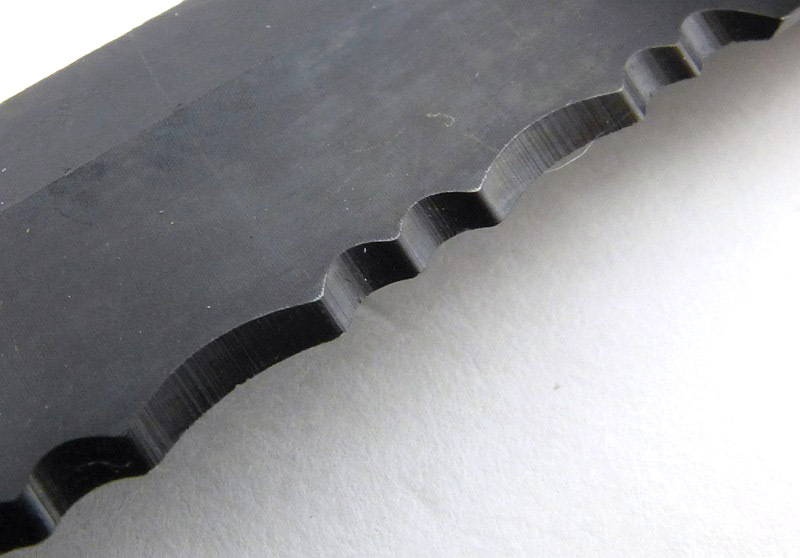 Sleipner steel is used for the blade. 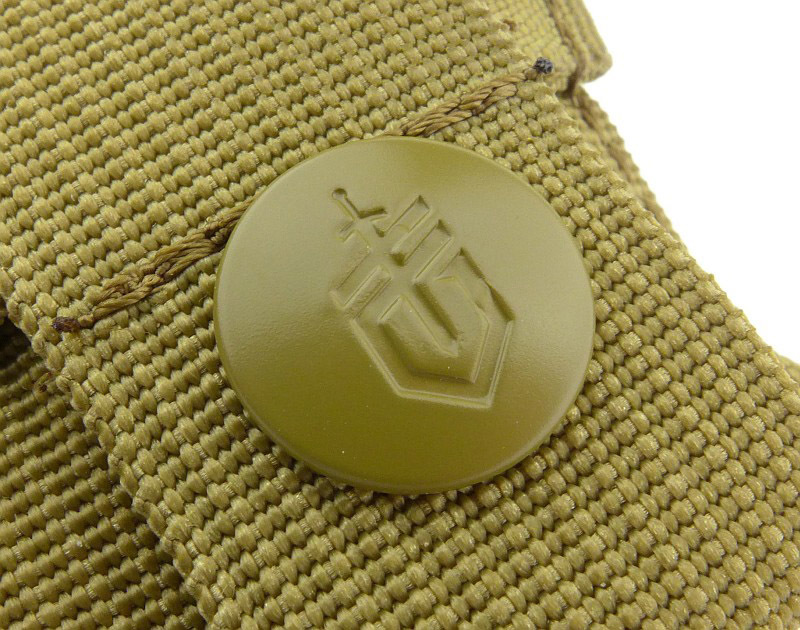 Integration of the back-lock lever into the design is flawless. 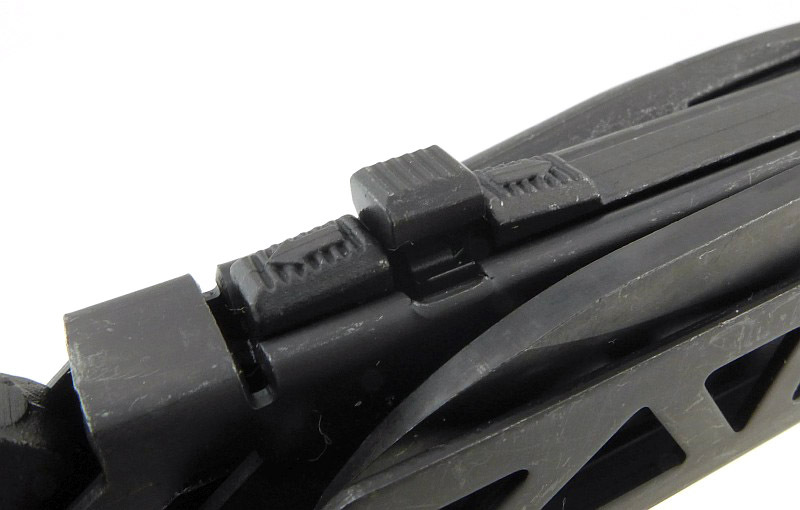 A TC tip gives the glass breaker real punch. 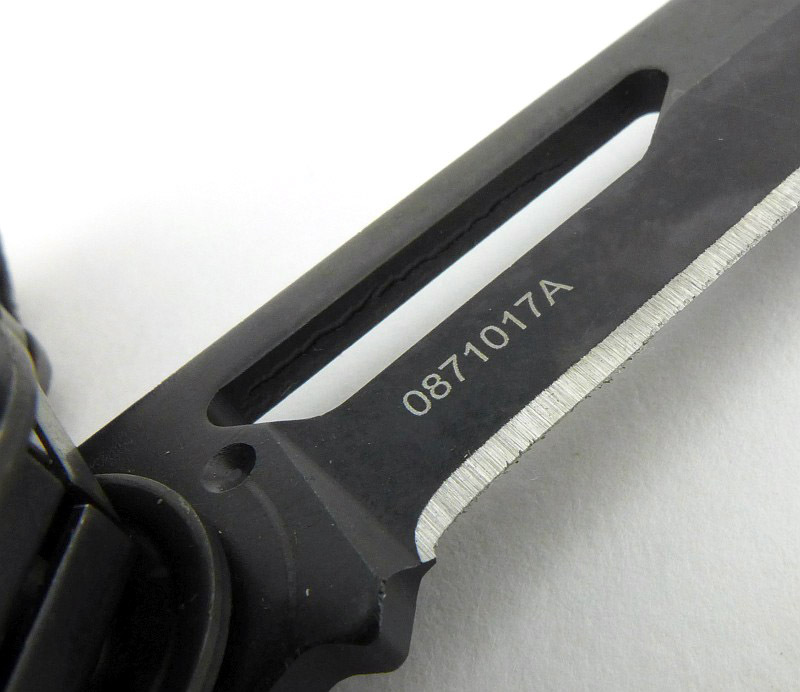 The 'TM' series marking is engraved on the blade spine. 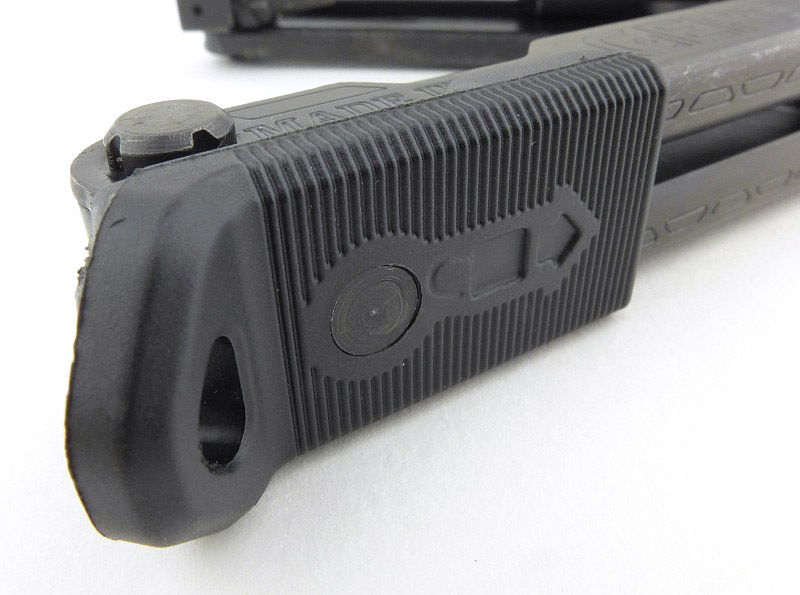 A deep finger guard is integrated into the handle. 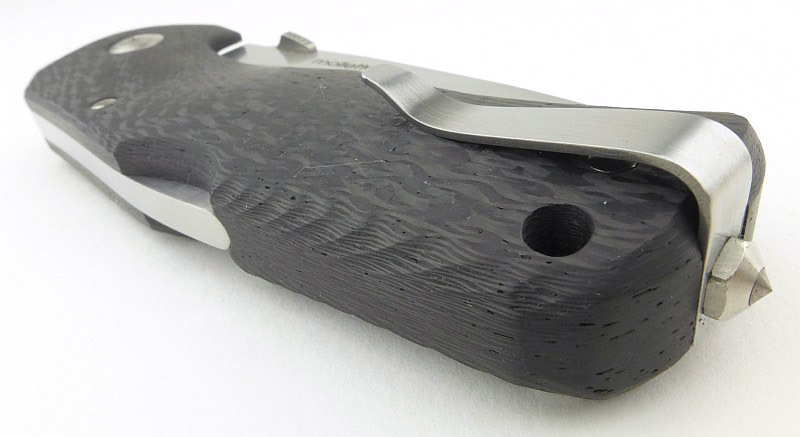 Looking along the one-piece handle shows the sculpted shape of the grip. 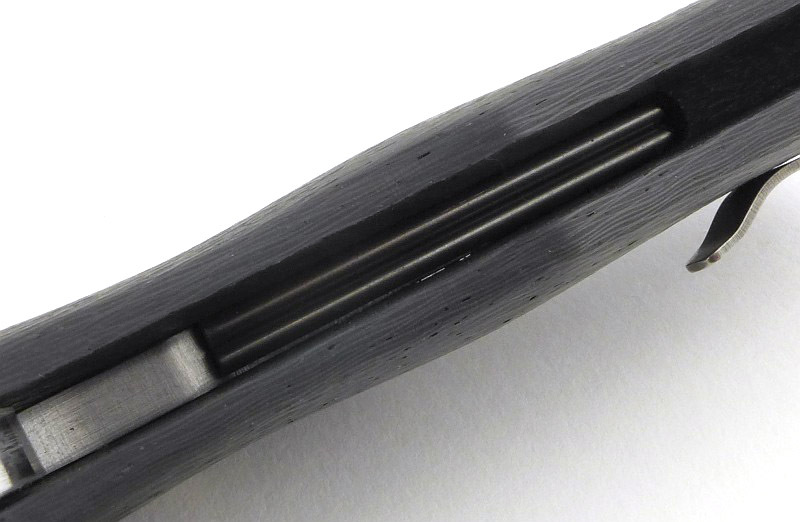 Deep inside the handle is the lock spring consisting of two round bar springs. 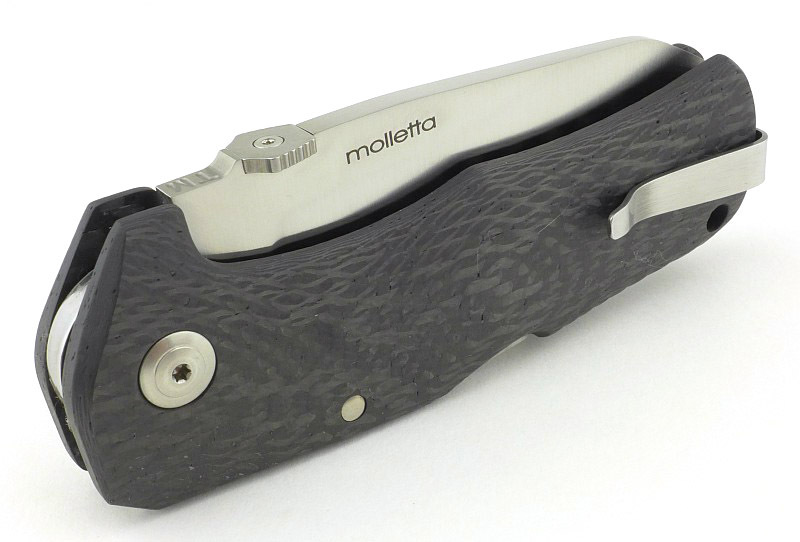 I had the good fortune to be able to consult Mik Molletta about this knife. The following images were discussion points that will be referred to. 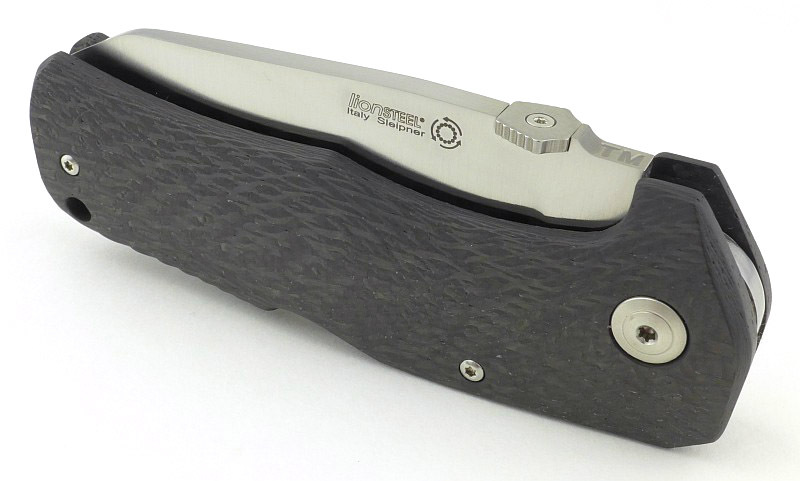 Mik is a prolific designer and the TM1 was one of his own projects that wasn’t commissioned by Lionsteel, but was then given to them. The following paragraphs are a combination of Mik’s own words and me incorporating the questions into the description (while attempting to leave the meaning unchanged). 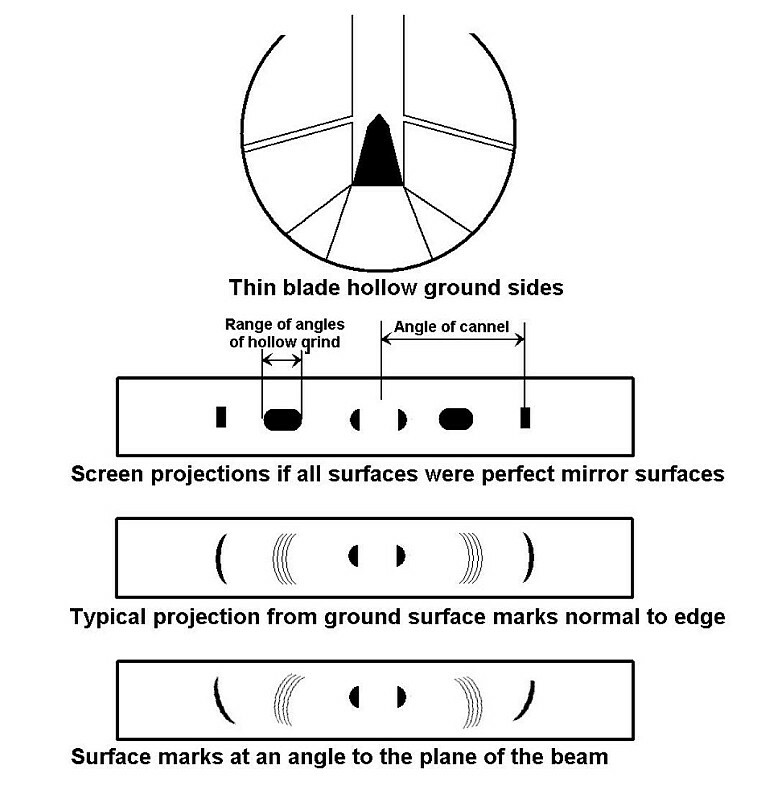 Sleipner steel (A) was chosen because it is a tool steel with good performance in cutting ability and toughness. 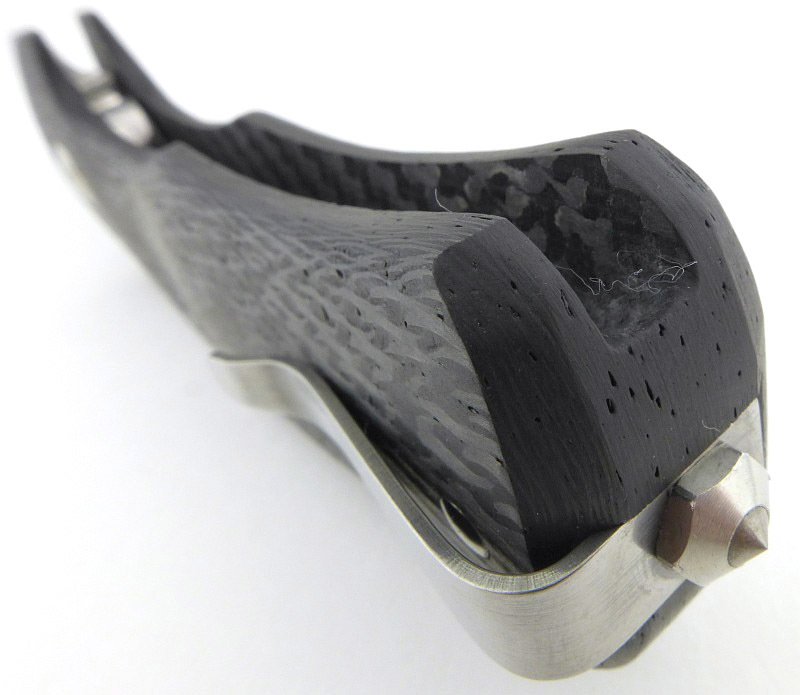 With a specific heat treating it has a very fine grain structure. 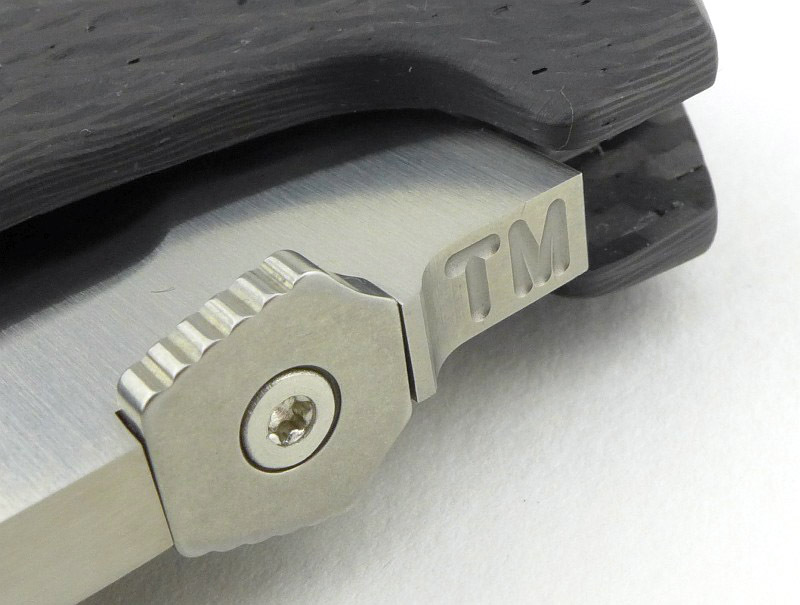 The blade thickness (J) makes the TM1 very durable for a long working life. Intended to be a real working knife, the overall shape and deep finger guard (B) reflect this purpose in the design. 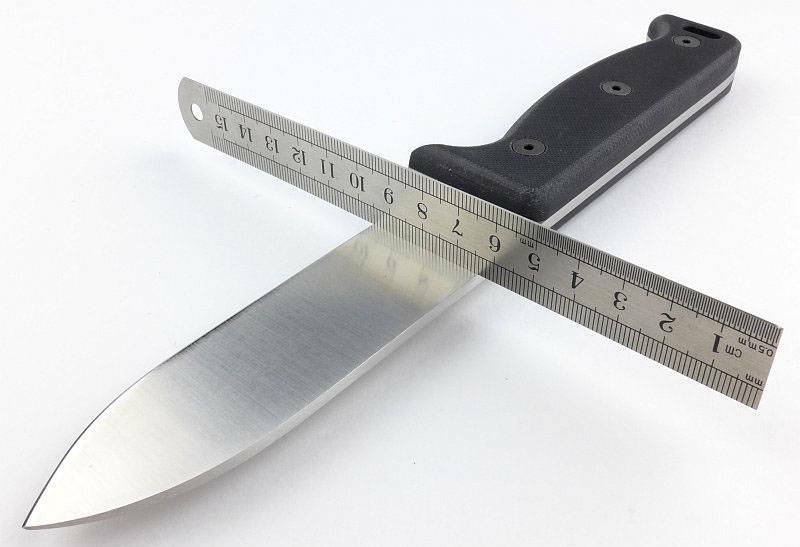 The knife also has a reinforced tip (C) suitable for processing hard materials. 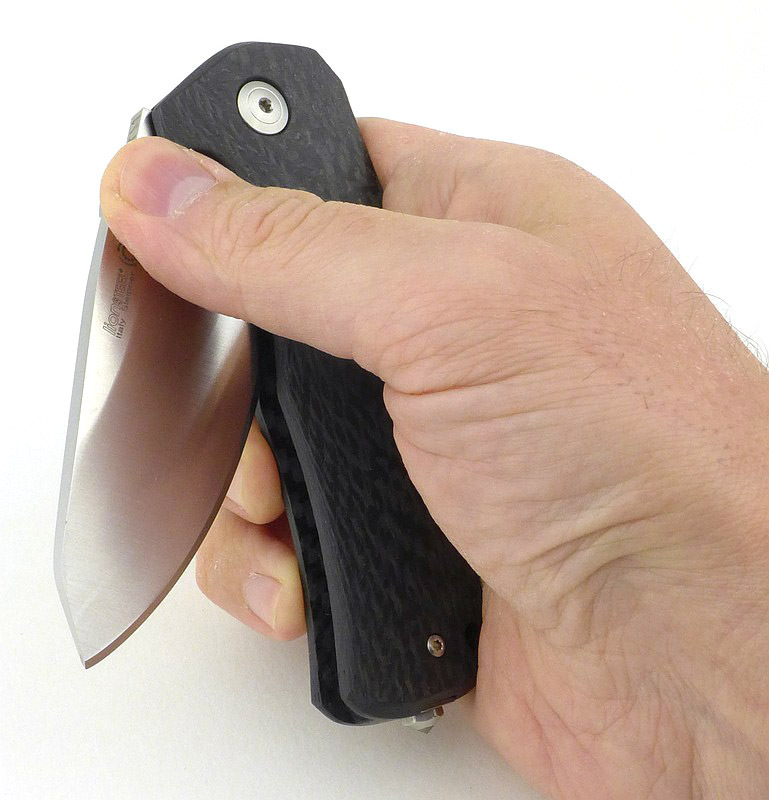 In lockback knives it is often observed when using them that there is play in the lock and/or pivot, sometimes pressing on the blade while working, the lever of the lock moves upwards. 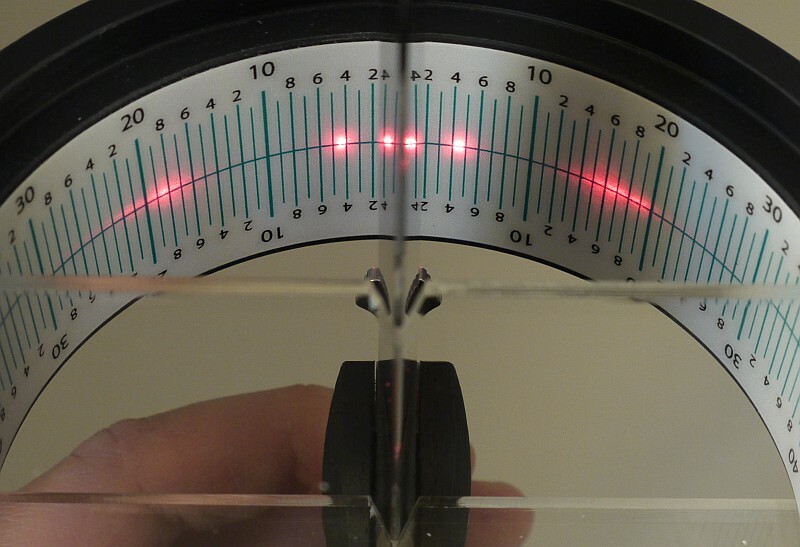 In the TM-1 there is no play in any axis. 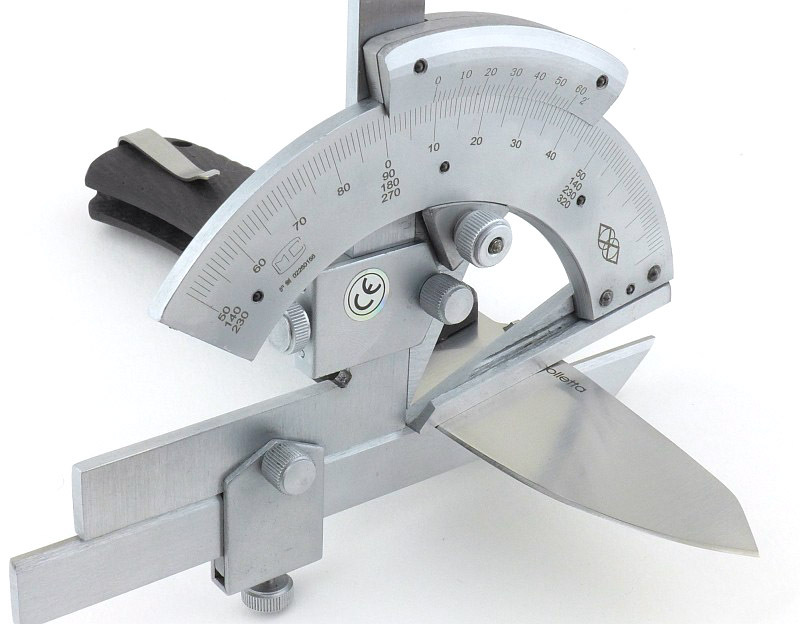 The particular architecture (D), made to high precision tolerances, eliminates the problems of the back-lock mechanism, and the presence of bearings facilitates the one hand opening normally difficult on these knives. 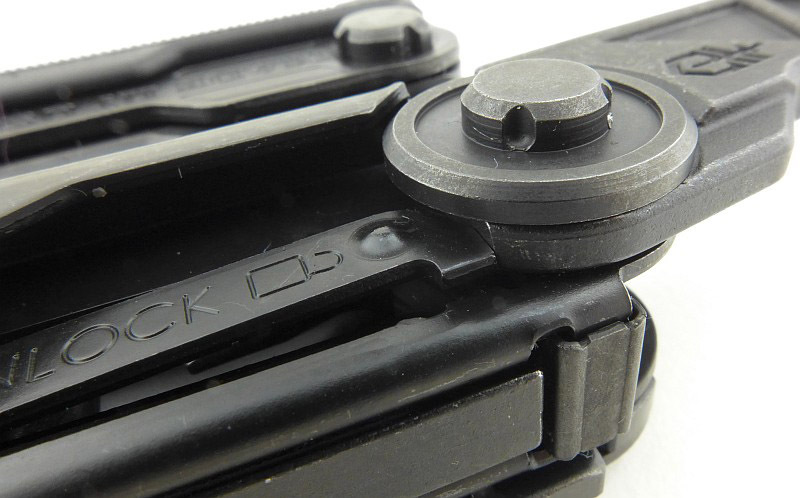 The lock-back system (I) when well executed is a safe and efficient and durable system. 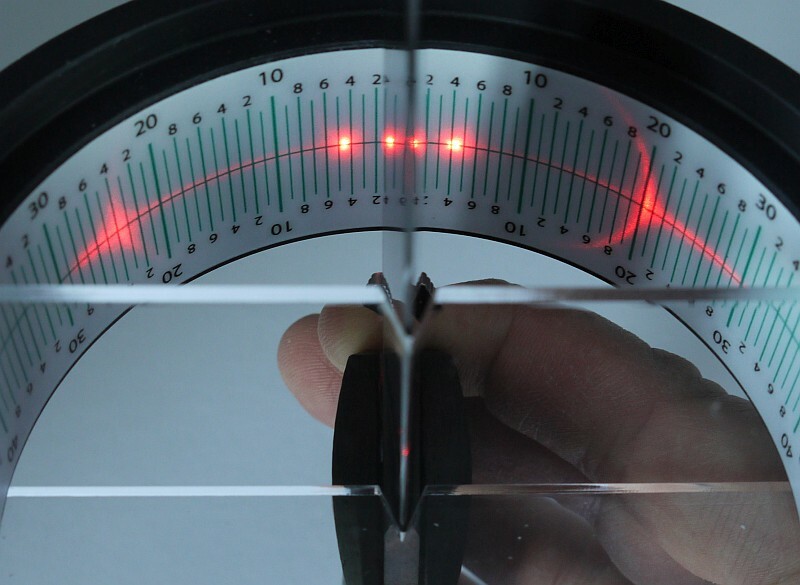 A glass breaker (E) is incorporated because it was designed to be suitable for military, police and rescue proposes. 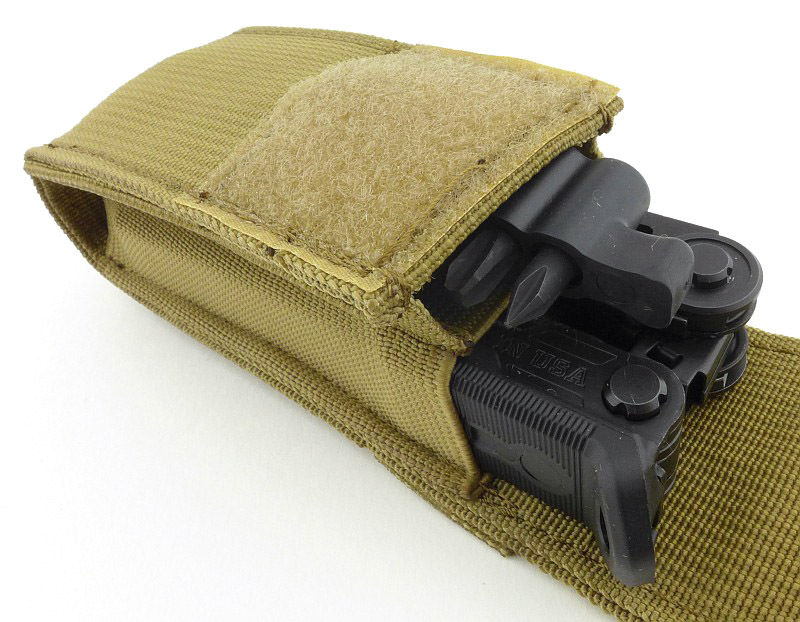 The pocket clip (G) is relatively short and is made to be not cumbersome and not to become annoying in use. 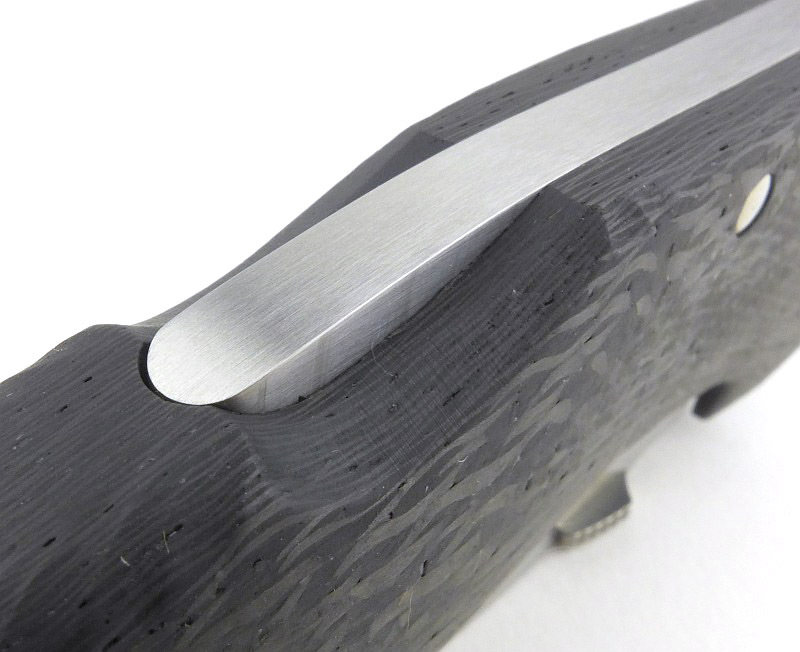 The handle surface texture (H) is slightly rough to provide grip with and without gloves, but without being troublesome for bare hands. 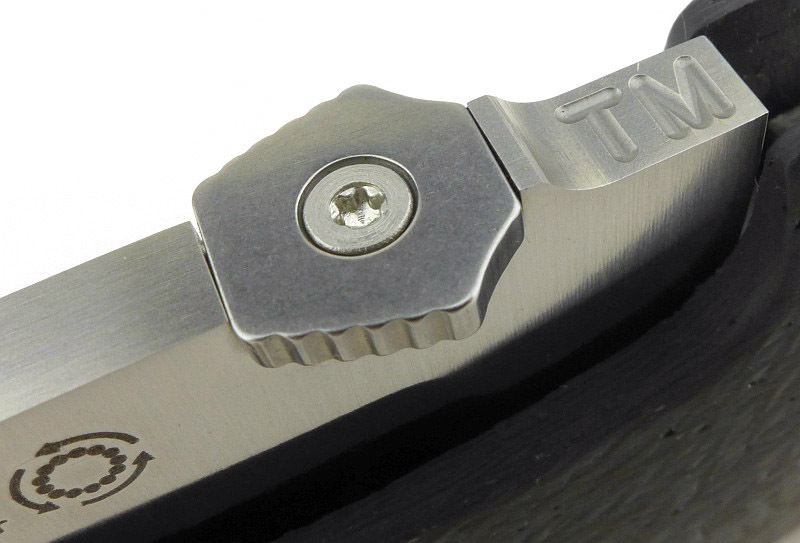 Angled shape thump opener (K) was used on the titanium version of Lionsteel’s T.R.E. Designed by me (Mik). It’s comfortable so used also on TM-1. One of the three BESS readings. 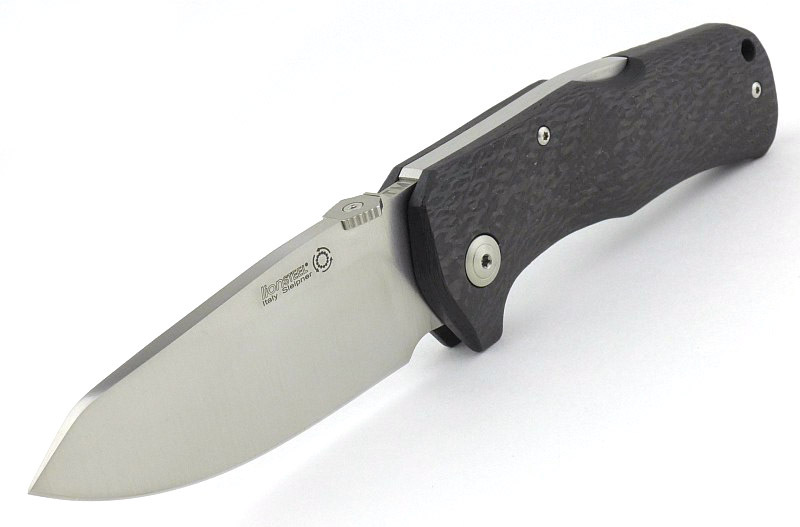 The blade is made from Sleipner 60-61 HRC steel. 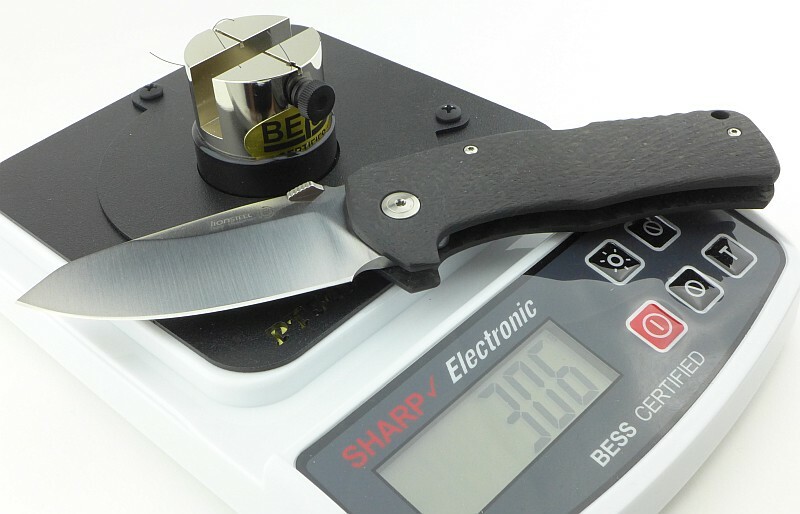 The TM1’s factory edge has an average BESS ‘C’ sharpness of 342. 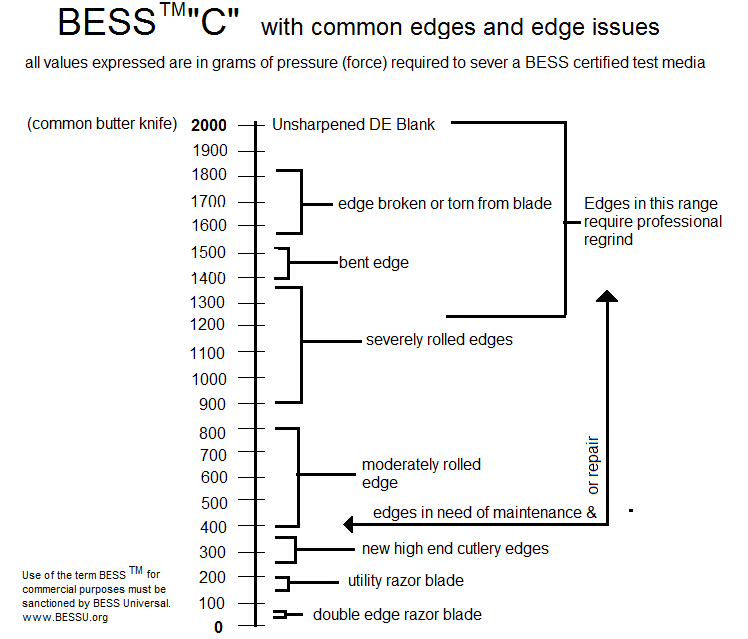 This was acceptable as it would slice 80gsm paper, but not to the level I like so I brought the edge to 15 degree per-side and 200 BESS for testing the knife. 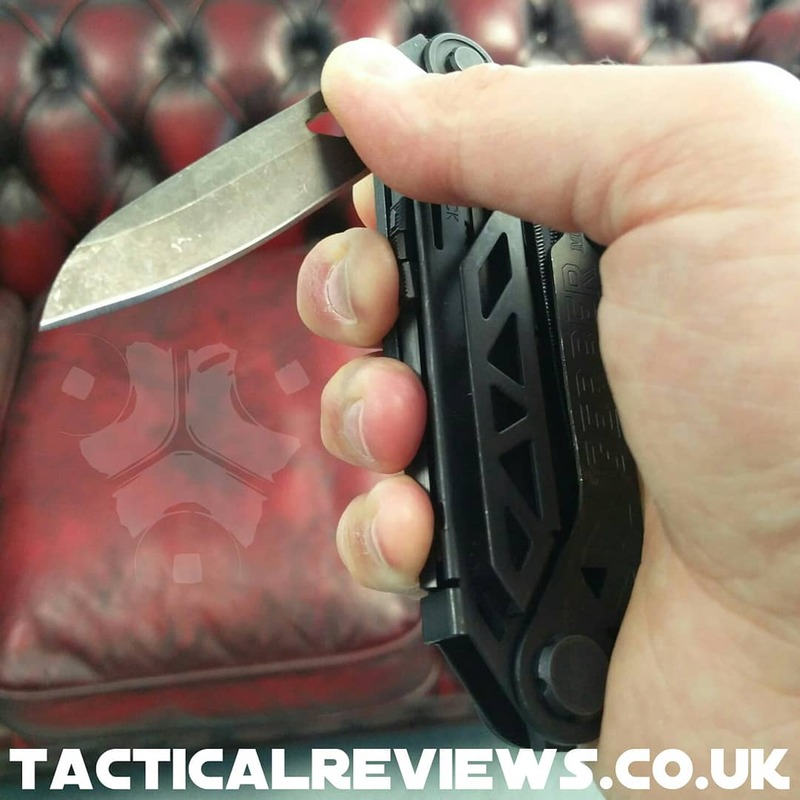 Lionsteel’s TM1 is a pleasant contradiction as it is a ‘heavy folder’ yet at the same time it is a ‘lightweight folder’ (for its size) thanks to the carbon-fibre handle. 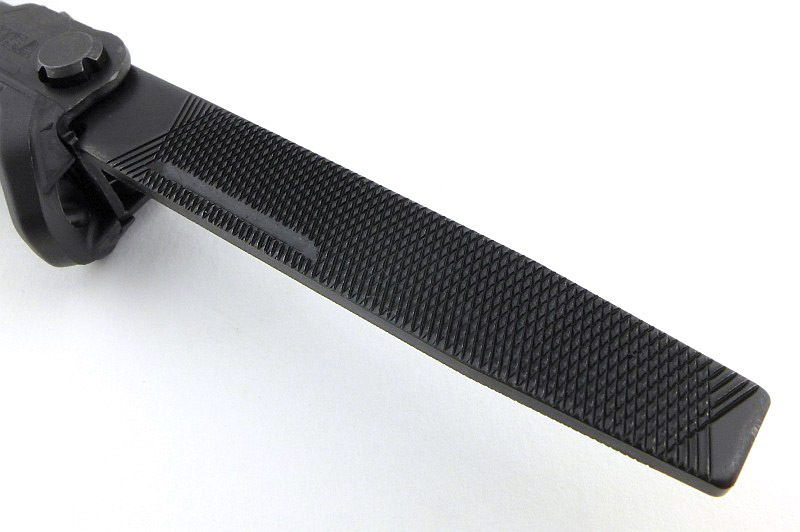 Although the blade is a substantial 4.5mm, making it massively strong, and the handle is matched to the blade perfectly, the TM1 is light and easy to carry. 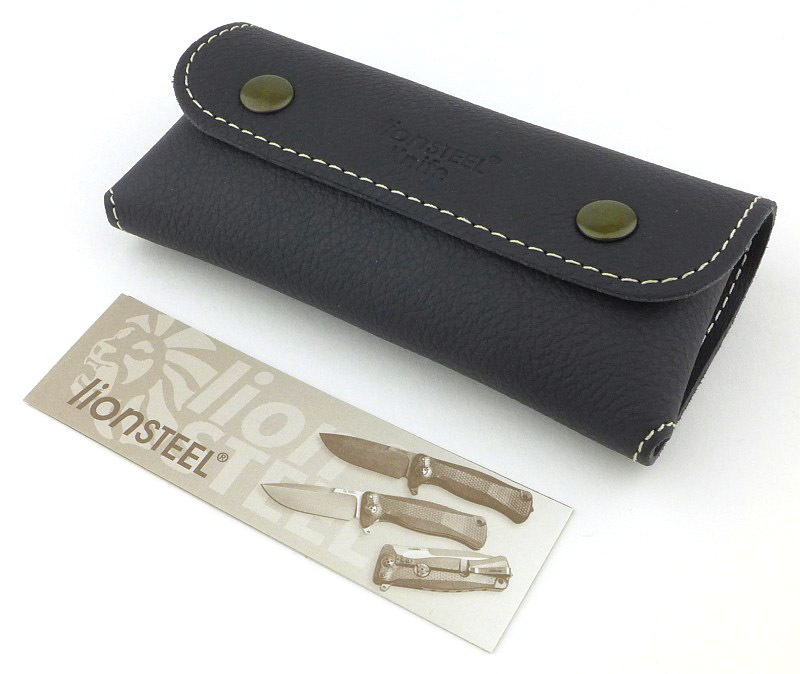 Thanks to its one piece sculpted handle and back-lock, the grip is excellent for a folder. 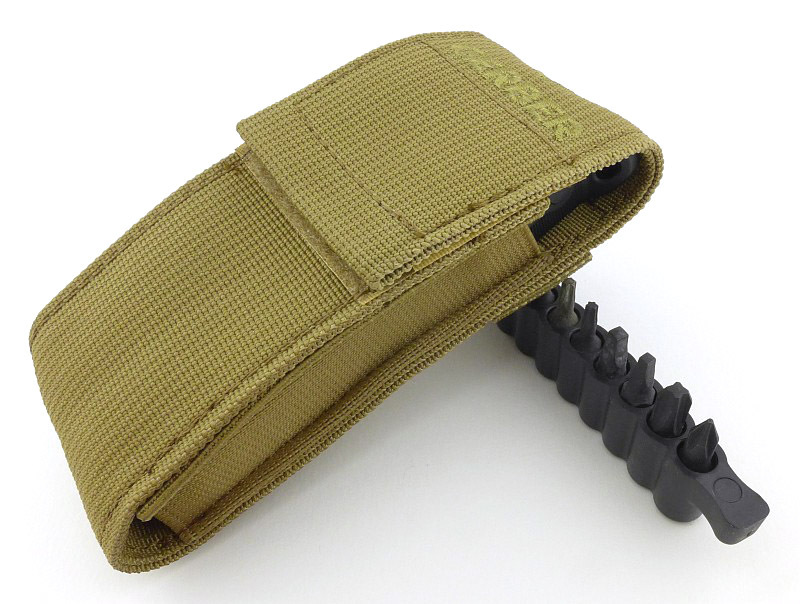 A fully integral finger guard makes the grip super stable and more than a match for that powerful blade. 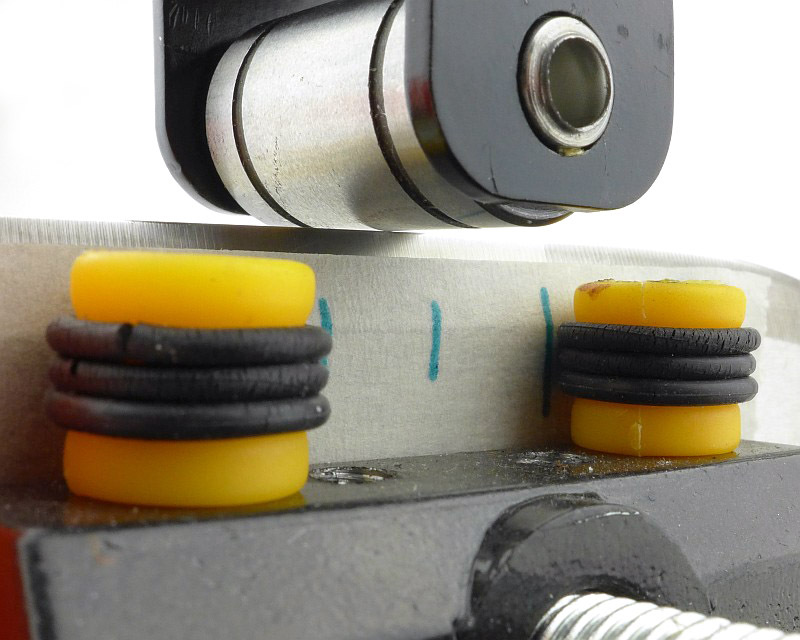 Opening is silky as the blade swings out smoothly and effortlessly on those ball bearings. 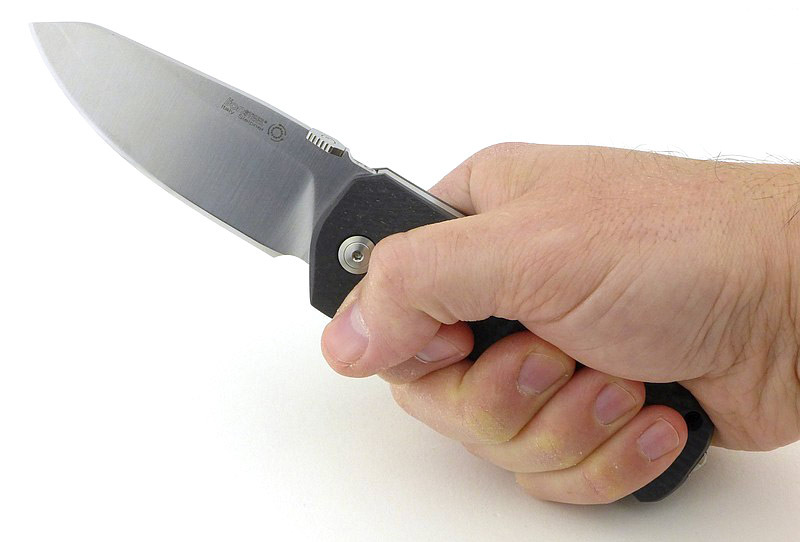 If you hold the handle and push the lock bar in fully, the blade actually becomes completely free to swing (without the lock bar pressing on it) and does so with no resistance at all. 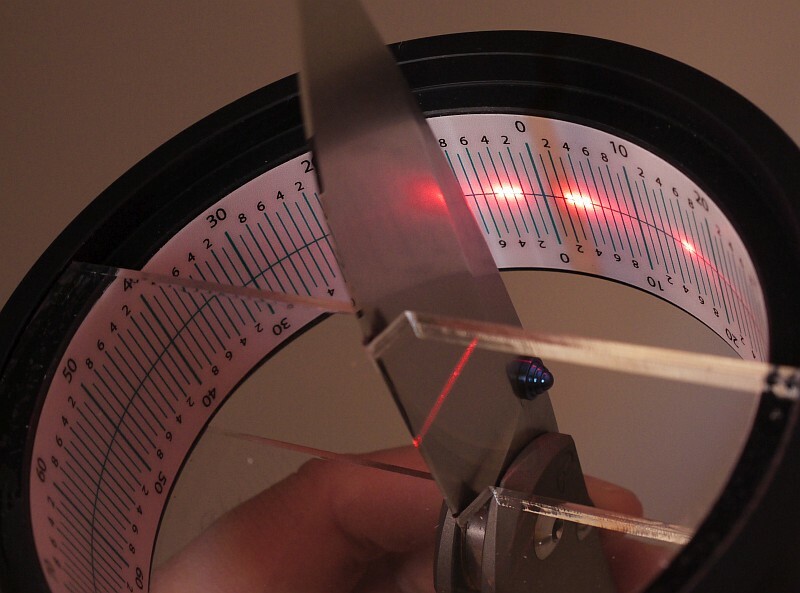 Not being a flipper I had wondered if it was worth using the ball bearings, but it is – the opening is just so slick. 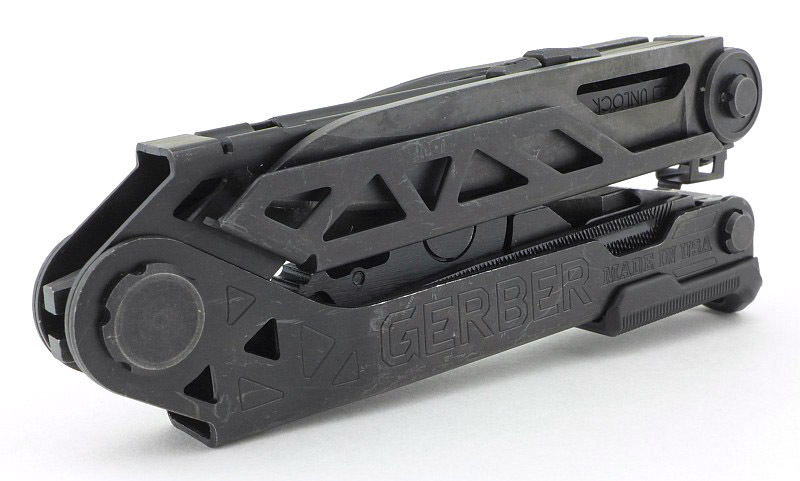 The thumb opener has been shaped into a ramp and gives a larger contact area for your thumb than studs do, and this makes it quite a bit more comfortable to use. 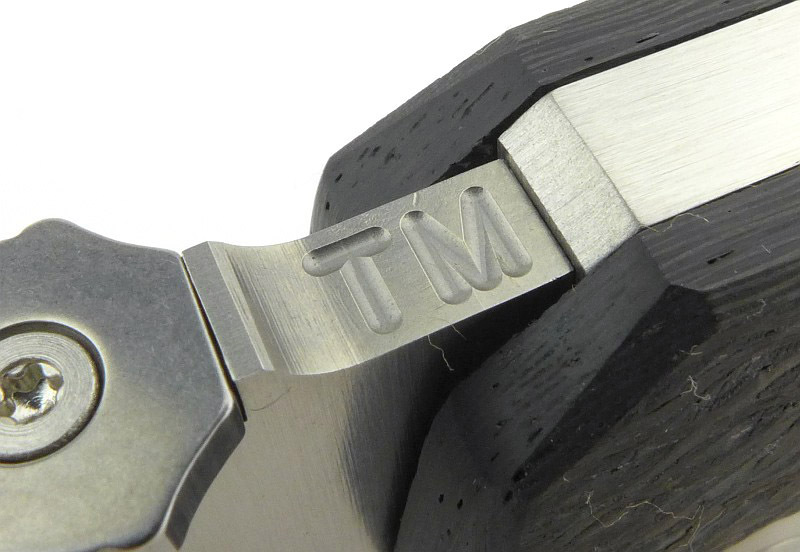 An edge re-profile brought the TM1 to life. 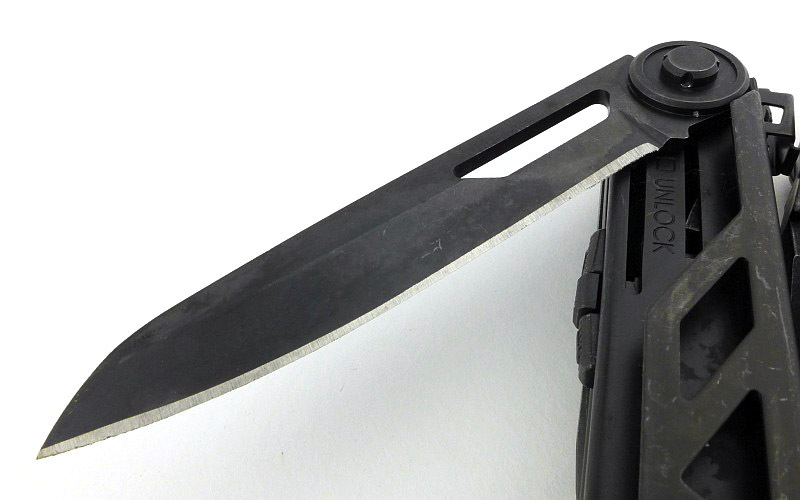 This is the first ‘reverse-tanto’ blade I’ve used, however the principle is not far from a clip-point, just a smaller clip, keeping the tip very strong. Slightly odd looking, it has proven to be highly usable. 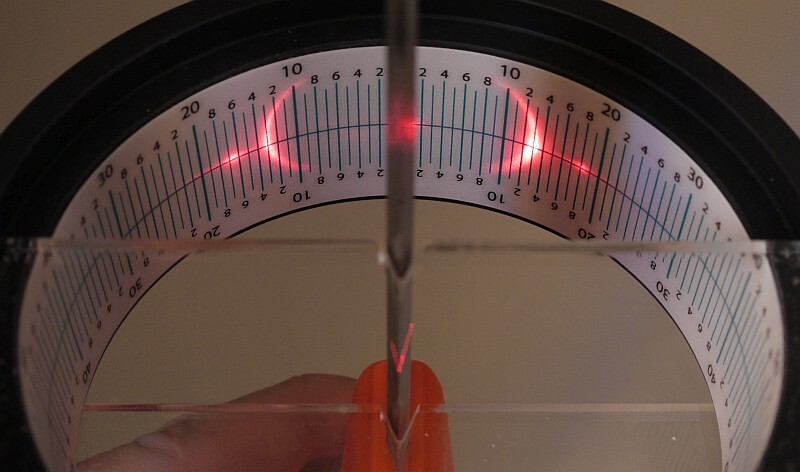 No issues with the tip’s puncturing ability even though the point angle is 71 degrees. The tip looks extremely strong, but as yet I’ve not had a reason to really put this to the test (no car doors have jumped out at me and needed cutting into). So ‘Sleipner’ in a folder? I was a little unsure about this choice with the reports of corrosion, and the fact it is not a stainless steel having only 7.8% Cr. 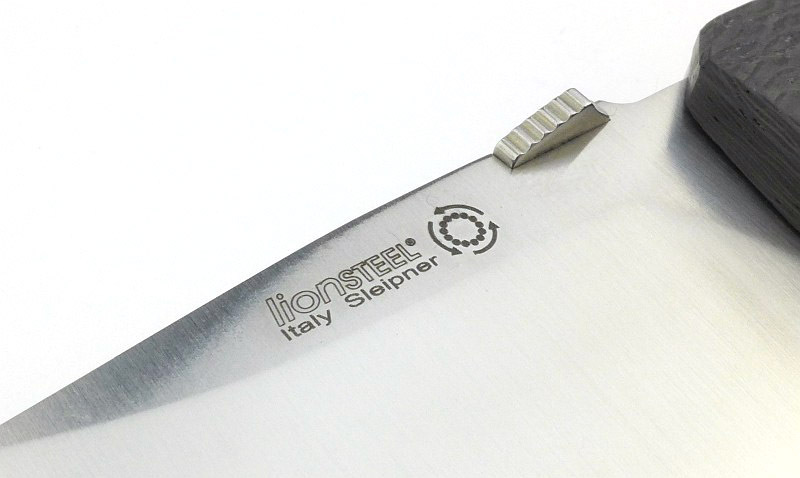 I decided that during the course of the testing I would not use any oils or other blade protection, and have been using this knife for around six months for a variety of tasks, including with foods, and with one in particular that is normally very harsh – banana! Opening and fishing about in boil-in-the-bag foods so getting a good dose of heat and steam, pocket time, handling and at best a little wipe down. 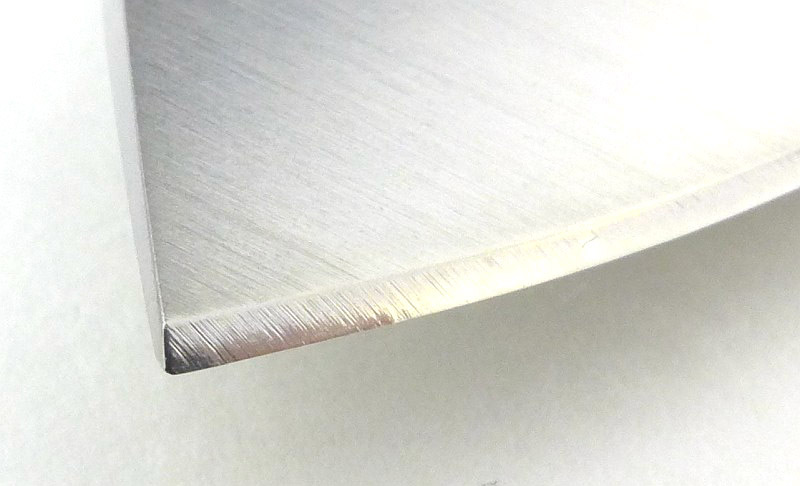 It is possible that the blade has been lacquered but I can’t see any evidence this has been done, and I reground the cutting edge bevel, so I know that is bare steel. To date there has not been any sign of corrosion. 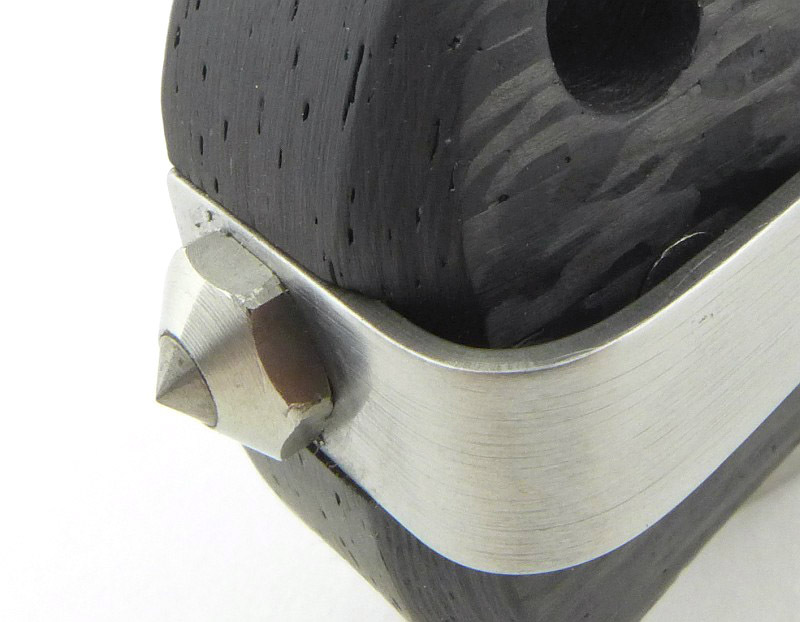 I had expected to have to intervene and remove some spotting as I haven’t been caring for the blade steel. This is not the same as specifically abusing it or really trying to get it to corrode, but the testing has been normal use with little to no attempts to protect it beyond a wipe from time to time. I’ll have to say I’m still a little wary that this might need more care than I’d like, but so far I’ve been pleasantly surprised that it has not been noticeably susceptible to corrosion. 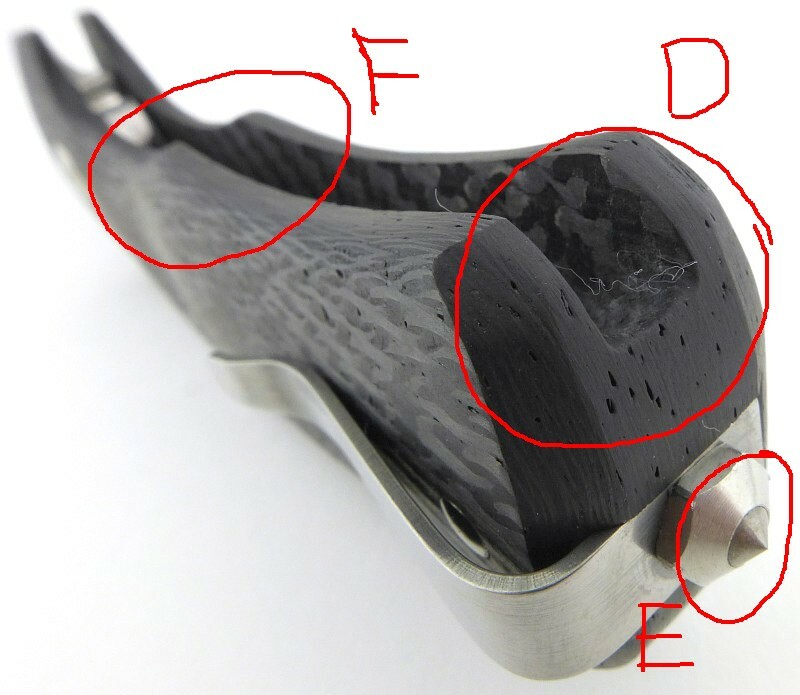 It is possible the specific heat-treat Mik mentioned may have improved the corrosion resistance of this steel. You might have spotted the relatively small looking clip, and like me assumed it was not going to work well. I found I was eating my words though. 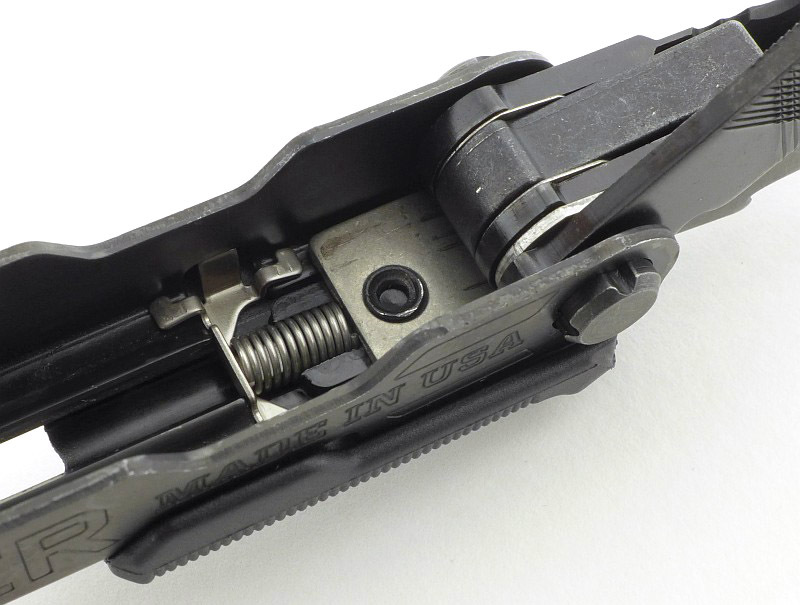 When I pocket-carried the TM1, that clip had enough clearance to get onto the pocket edge and enough flex to slide into place, yet enough grip to stay put. I had dismissed this clip as an afterthought, but was wrong, it works. 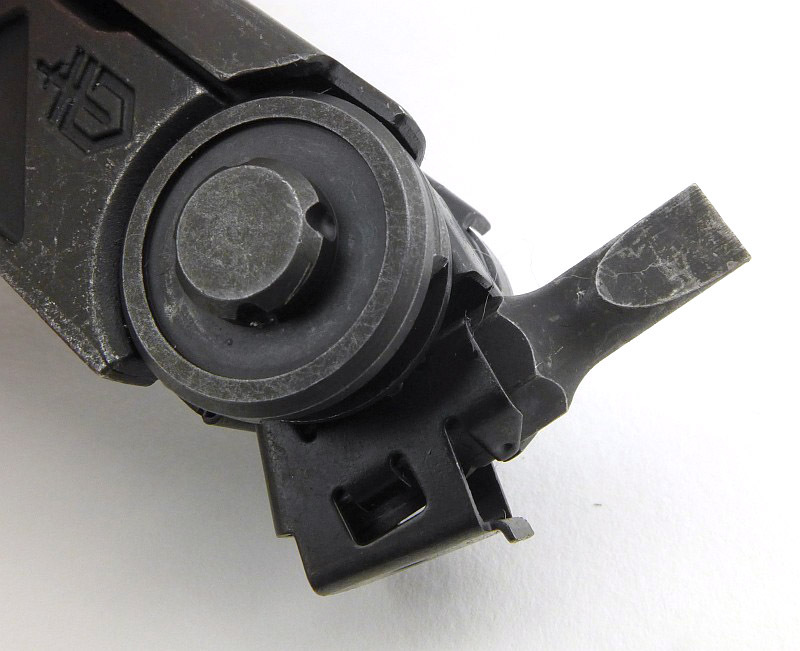 The clip can also be removed and refitted on the other side. 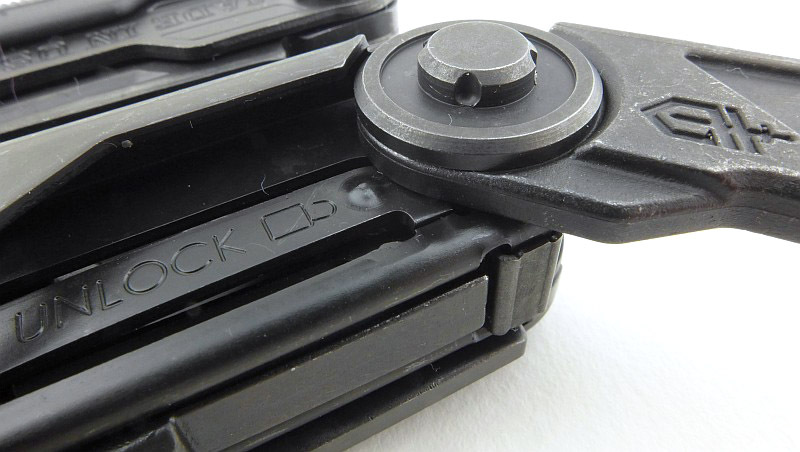 IKBS pivot bearings for super smooth action. Works for right and left-handed users. 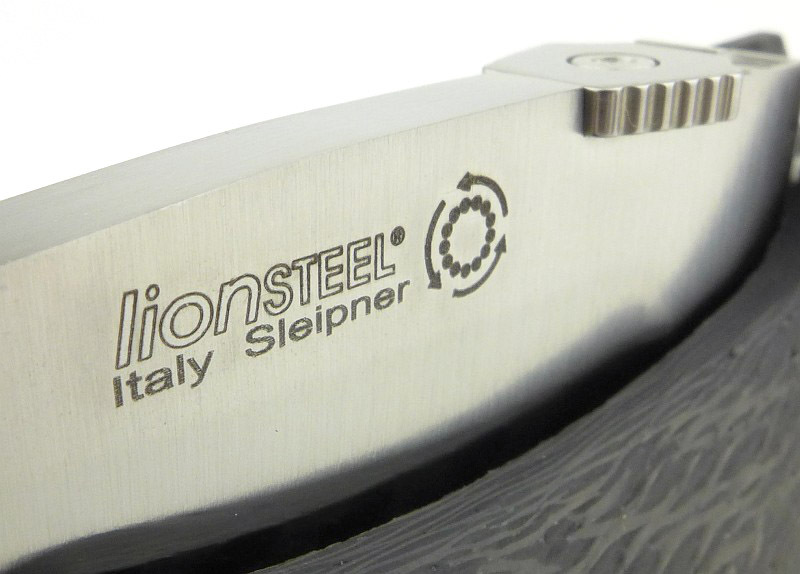 Sleipner steel – I don’t like the threat of corrosion hanging over a fantastic knife. 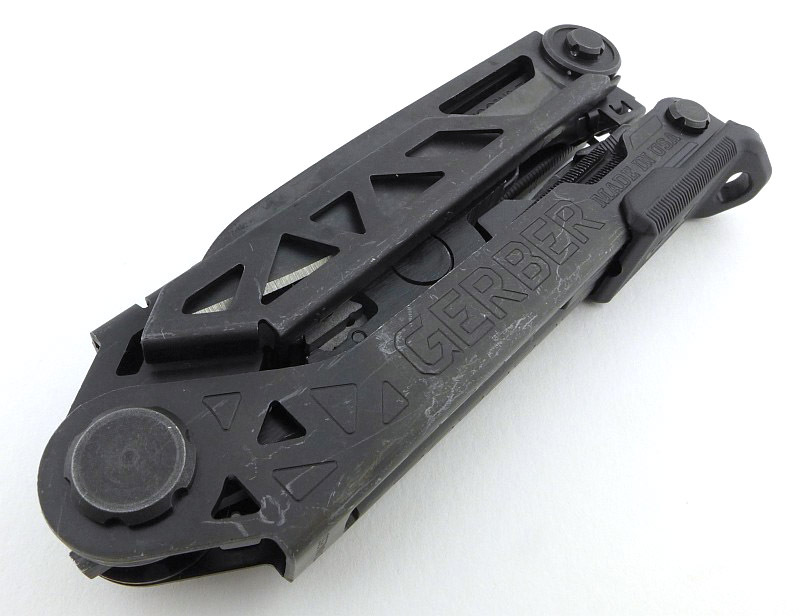 Gerber’s Center Drive multi-tool may be one of many in the highly competitive multi-tool market, but its name clearly tells you what its key design feature is. 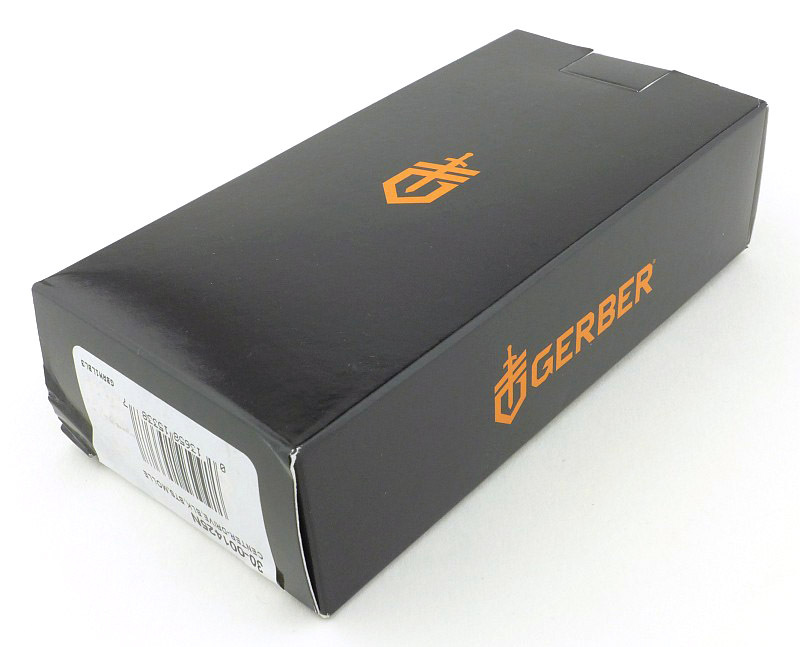 Gerber have gone all out with the capabilities of the built-in screwdriver bit holder, along with considering the ergonomics when using a screwdriver which has a multi-tool as the handle. 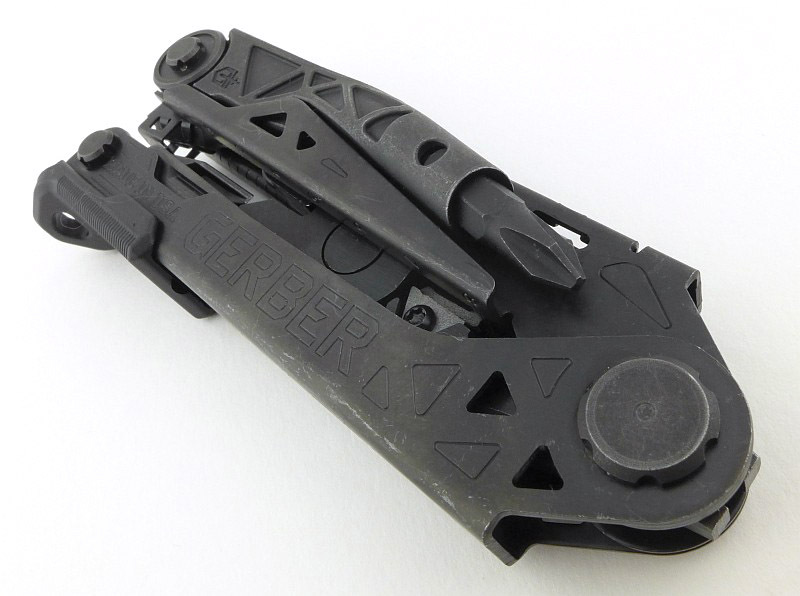 So Gerber aligned the axis of the bit holder to be as close to the centre line of the tool as possible. 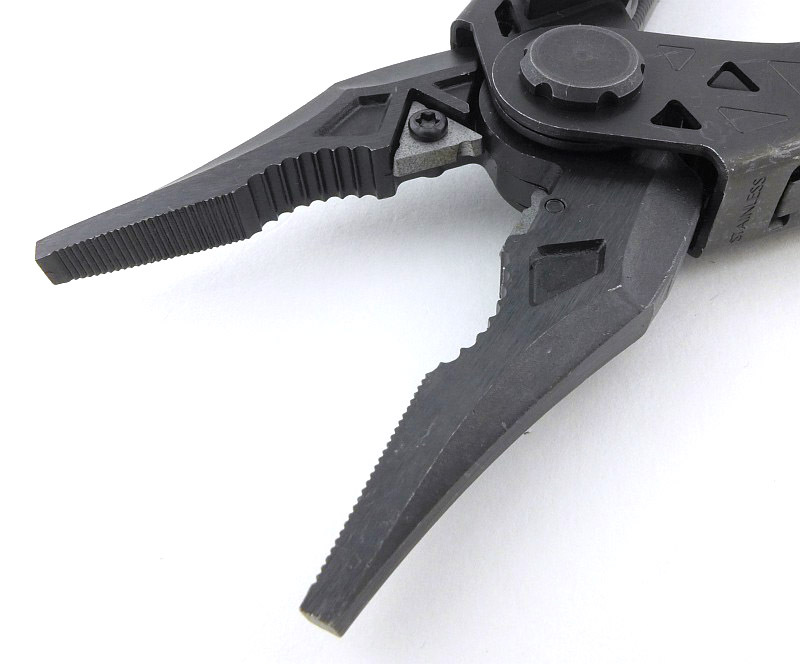 The Center-Drive tool also includes a larger than normal knife blade, powerful sprung pliers with replaceable wire cutters plus even more. We’ll be taking a good look round this tool, first what is in the box, then focusing on the headline feature before taking in the rest of it. A quality pouch is provided. The bits are standard 1/4" Hex fitting. 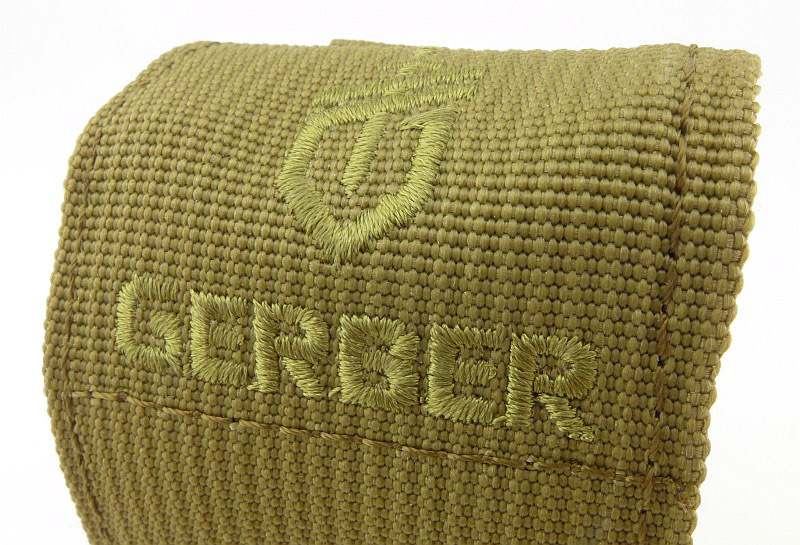 The pouch has an embroidered logo. 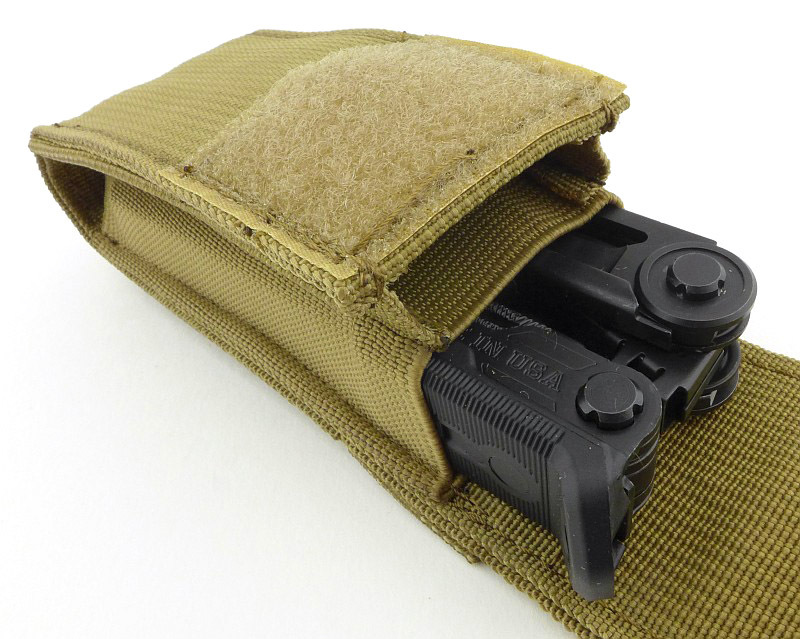 Usable as a belt pouch or MOLLE mount. 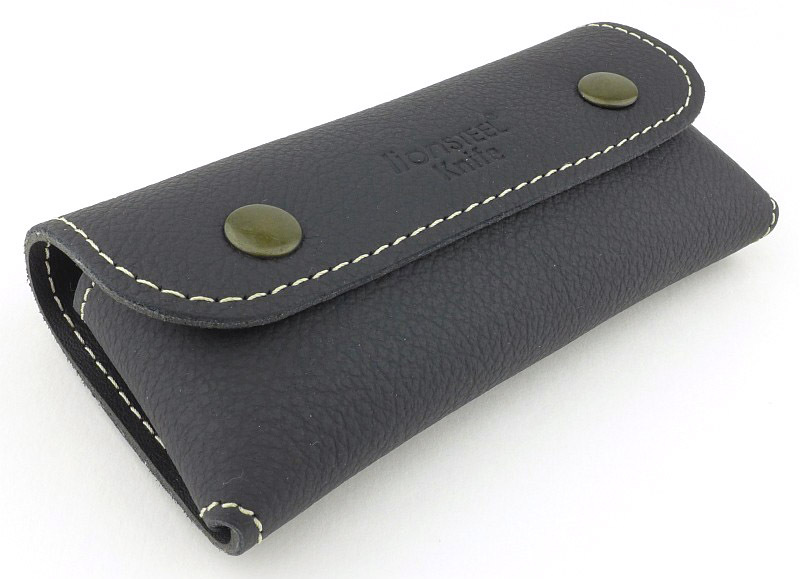 Separate compartments for the tool and bits keeps things neat. 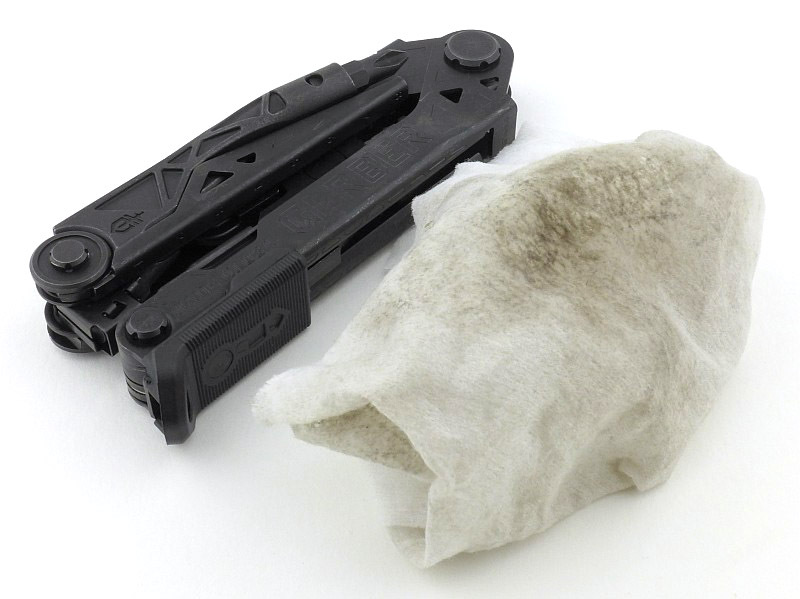 Tool and bits both fitted in the pouch does make it a bit thicker. Beware the black finish (as is typical) initially comes off enough to make things dirty. The 'centre' in Gerber Center-Drive. 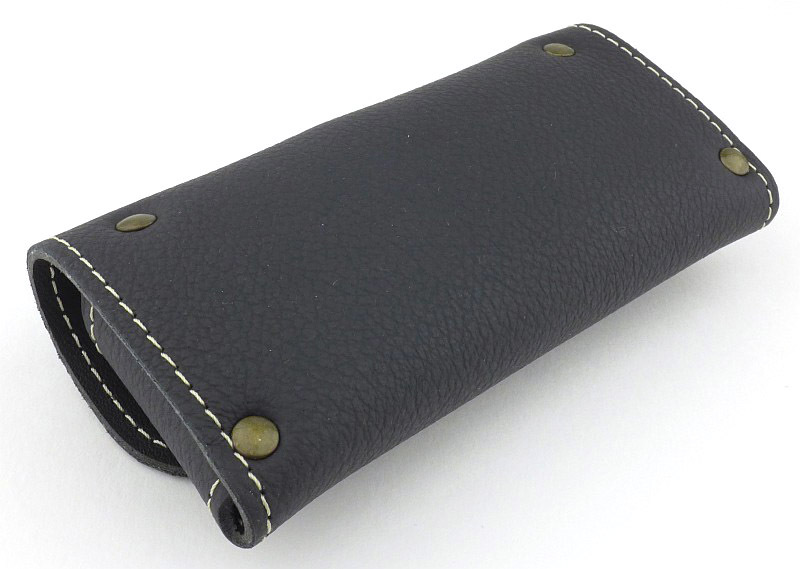 That long bit holder folds in neatly. 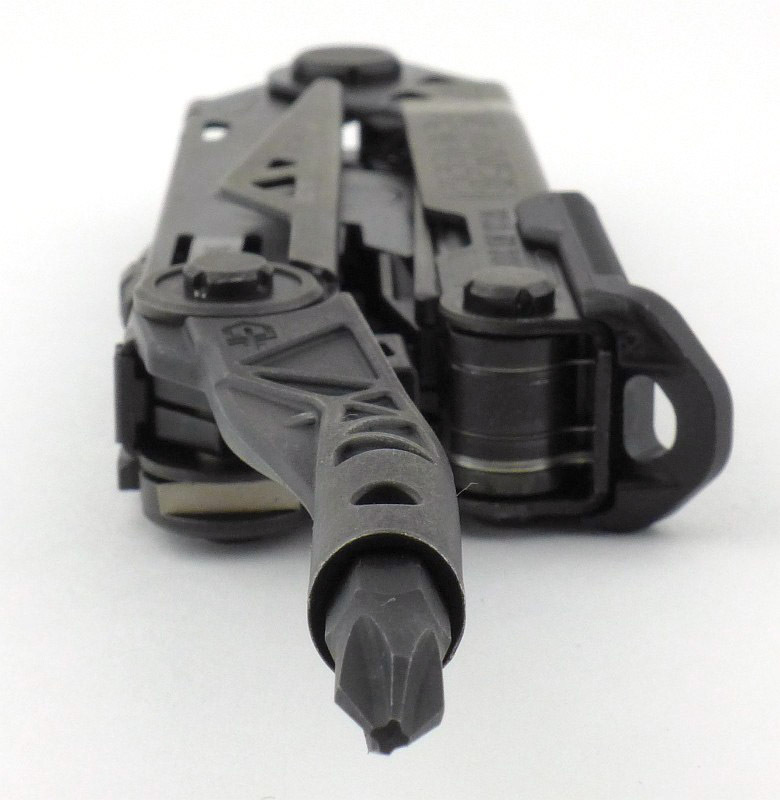 The Center-Drive's bit holder gives more reach than other multi-tools. 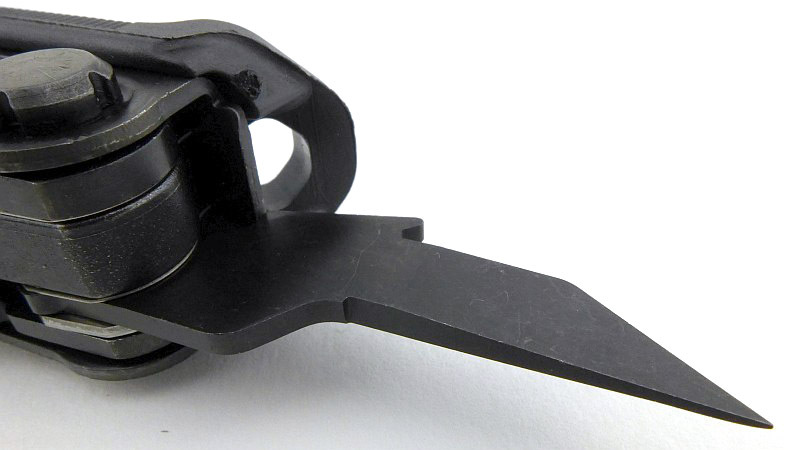 A liner-lock style lock secures the bit holder in the open position. 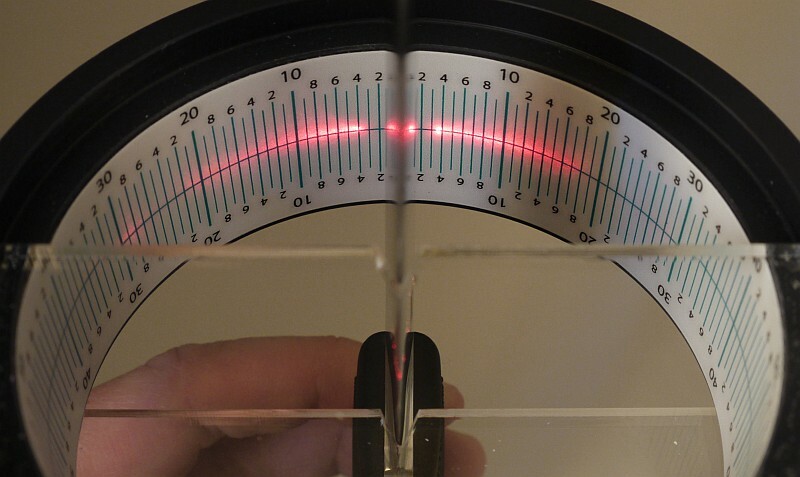 Though centred in one axis, the bit holder does sit slightly to one side. It takes standard 1/4" Hex bits. 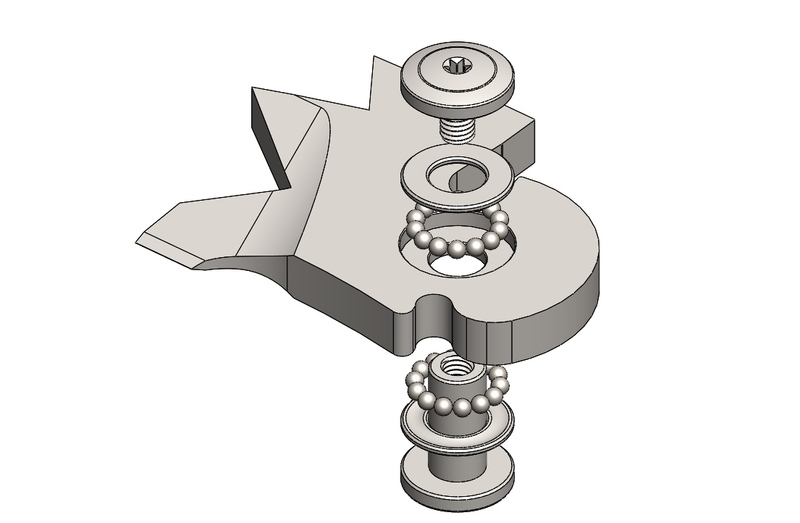 A magnet holds the bits in place. 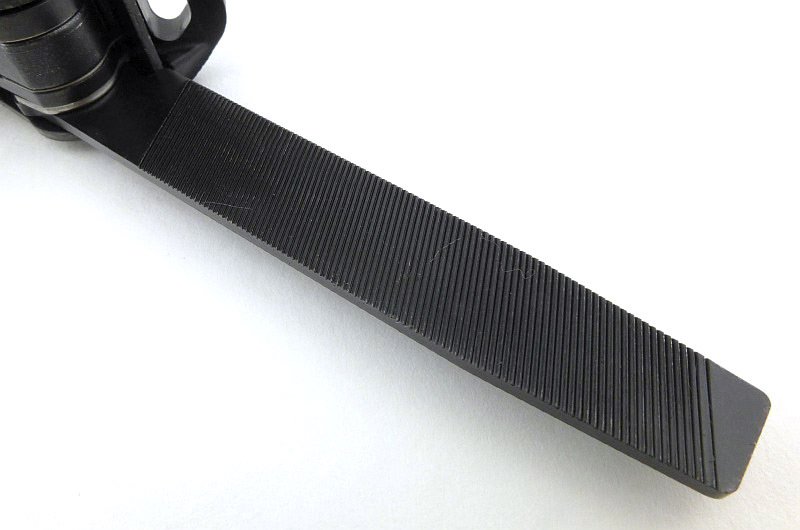 A small friction-ramp holds the bit holder in the closed position. 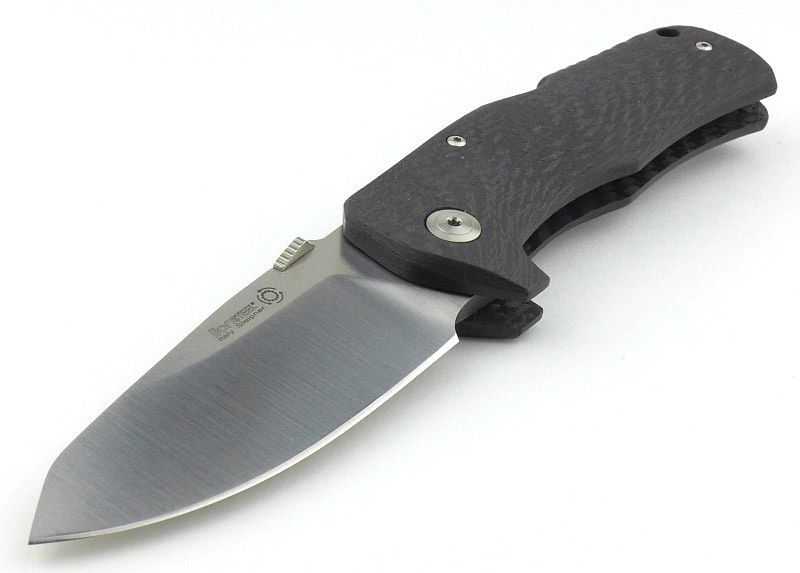 With the featured functions of the bit driver and large knife blade, the Center Drive has an asymmetrical layout with one handle carrying these features on the outside, and the other handle having further tools folded into the inside; this gallery takes you around all of these. 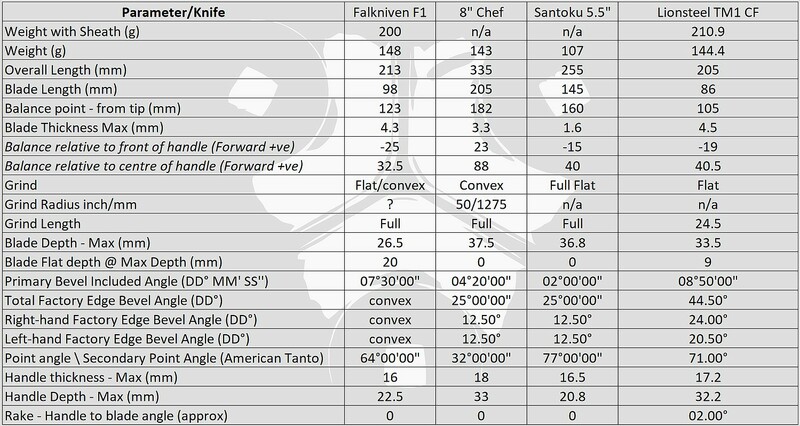 Working our way round - the knife blade. 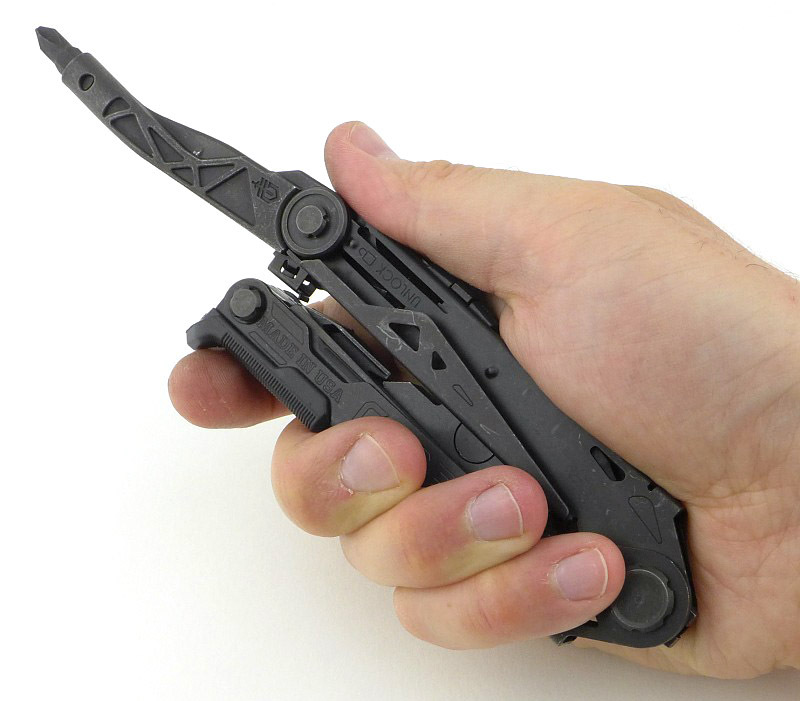 A longer than average blade for a multi-tool. 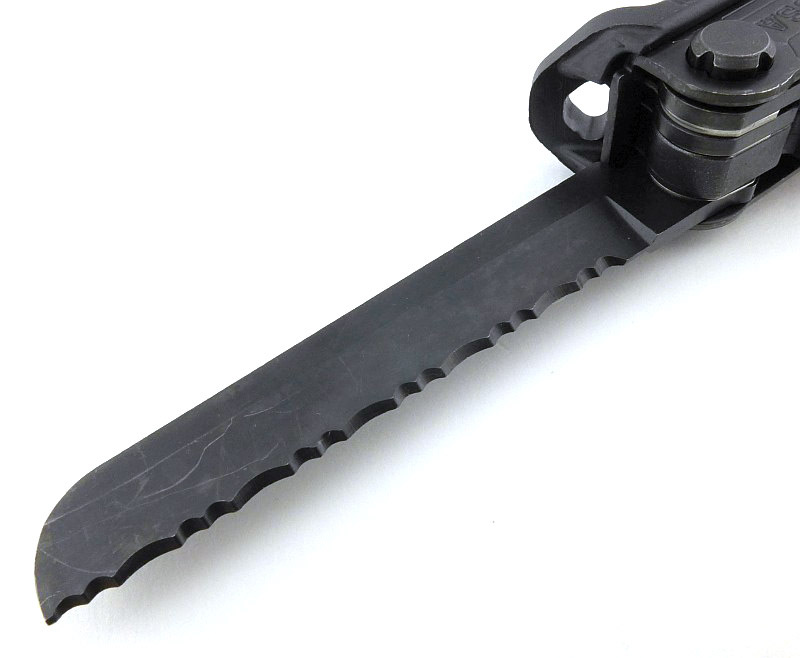 A liner-lock keeps the blade open. This blade arrived with burrs left on. A quick strop and this was fixed. 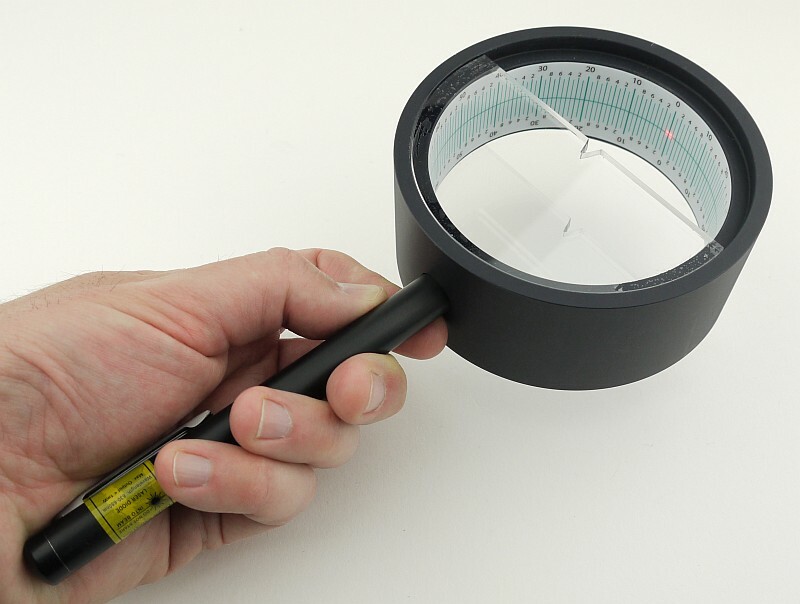 A long and thin opening hole needs to be used with care. 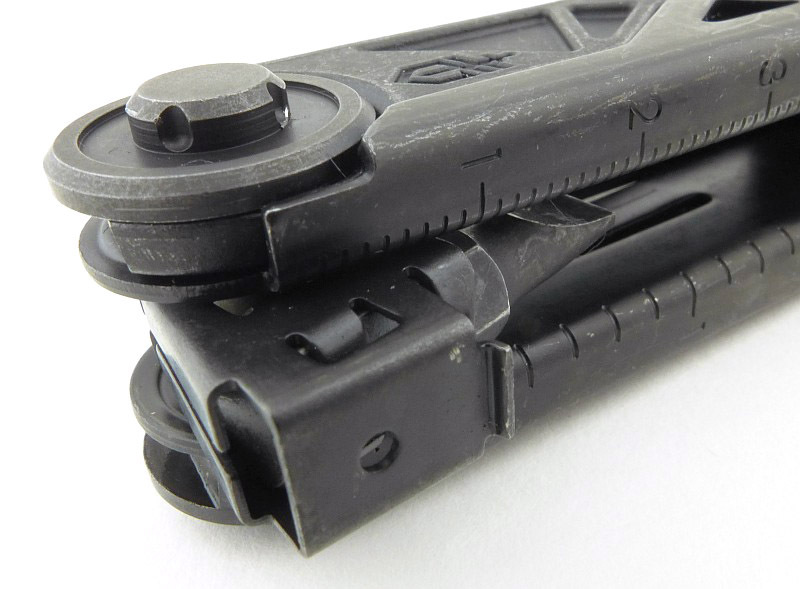 With the pliers retracted the locking button sits low. 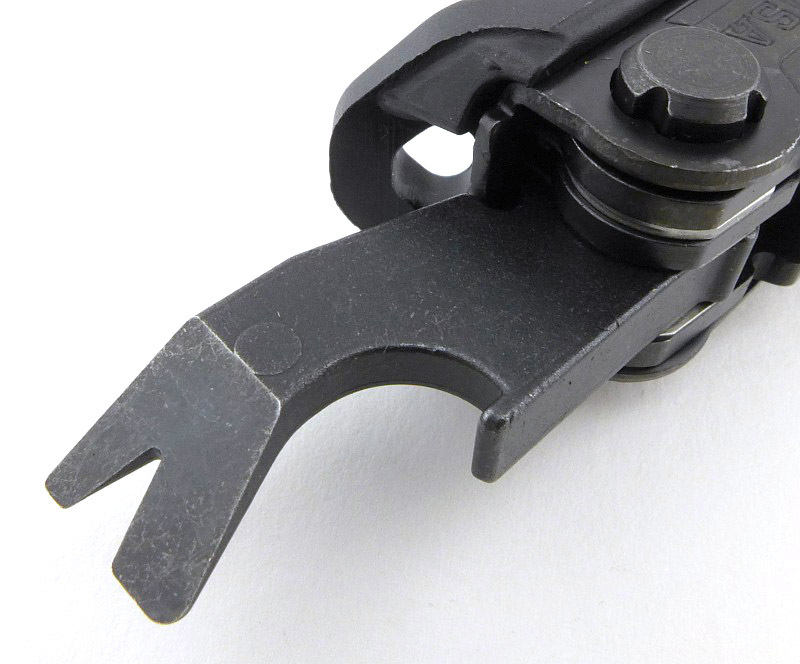 When the pliers are open the locking button clicks into place. The pliers are sprung so the handles open themselves. 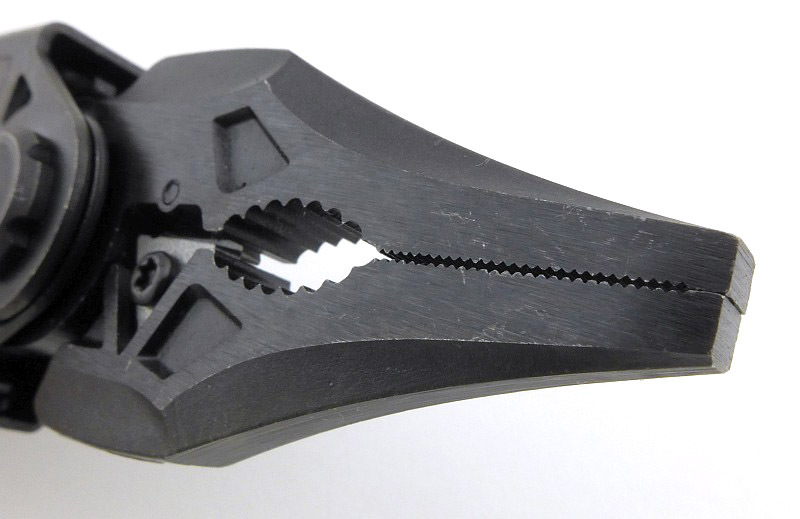 It has multi-purpose needle-nose pliers. 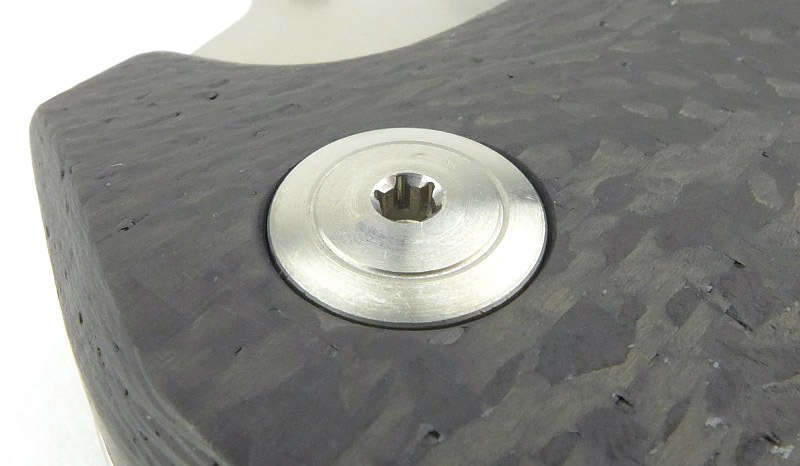 Rotatable and replaceable wire cutting jaw inserts are used. 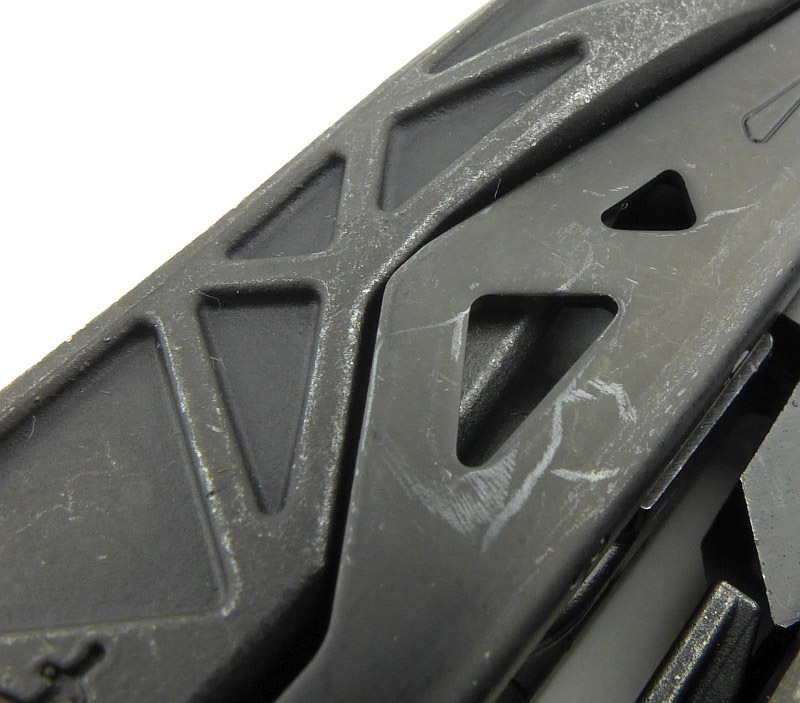 These inserts have a wire trapping notch. Jaw alignment is very good. 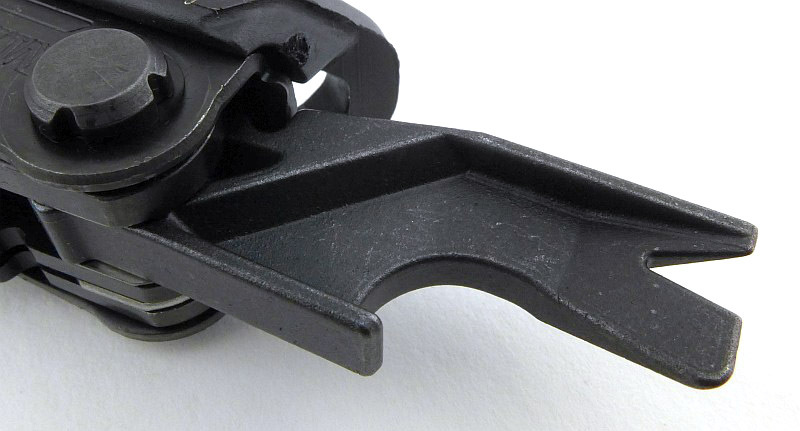 Inside one handle is a single bit holder. The tool can have one bit here and one in the main bit holder. 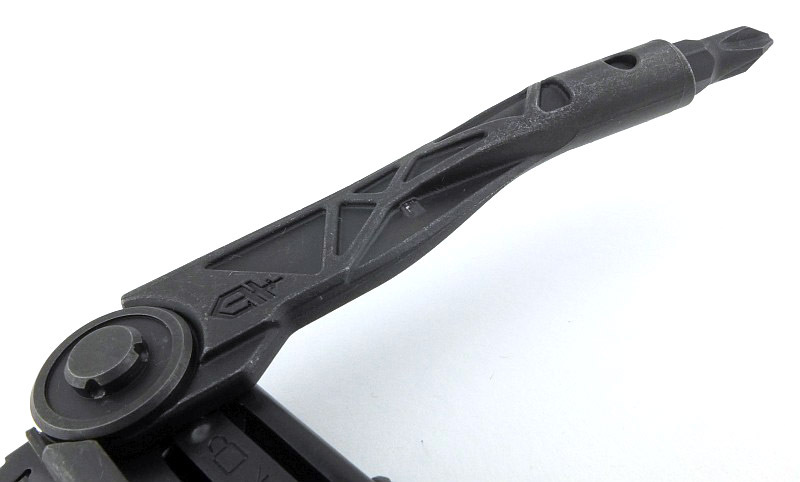 The other handle has four other folding tools. 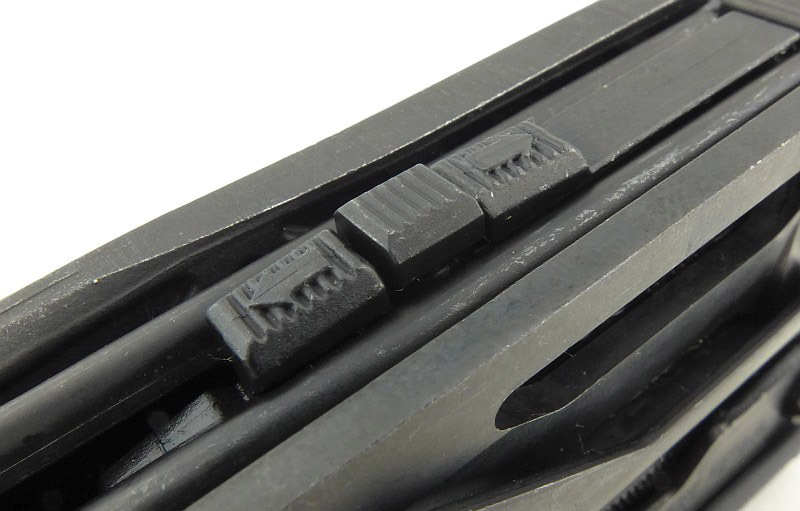 A plastic slider locks and unlocks these tools. 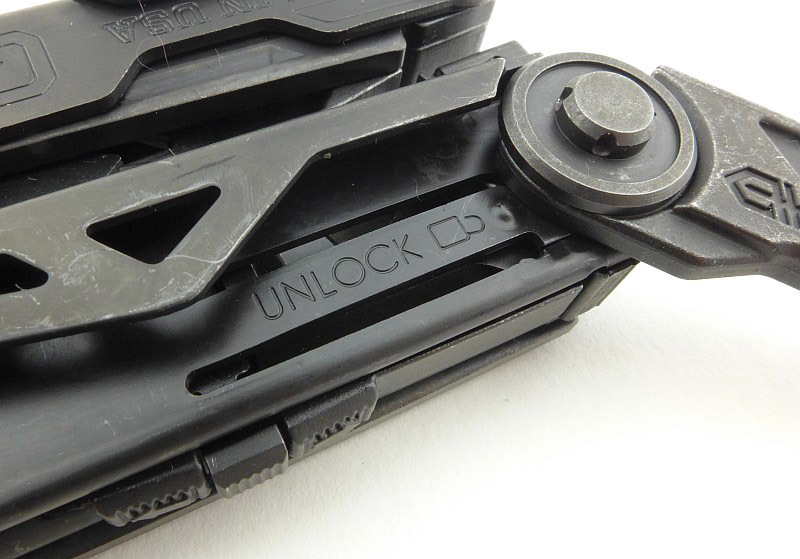 As you open each tool the sliding lock is pushed back. 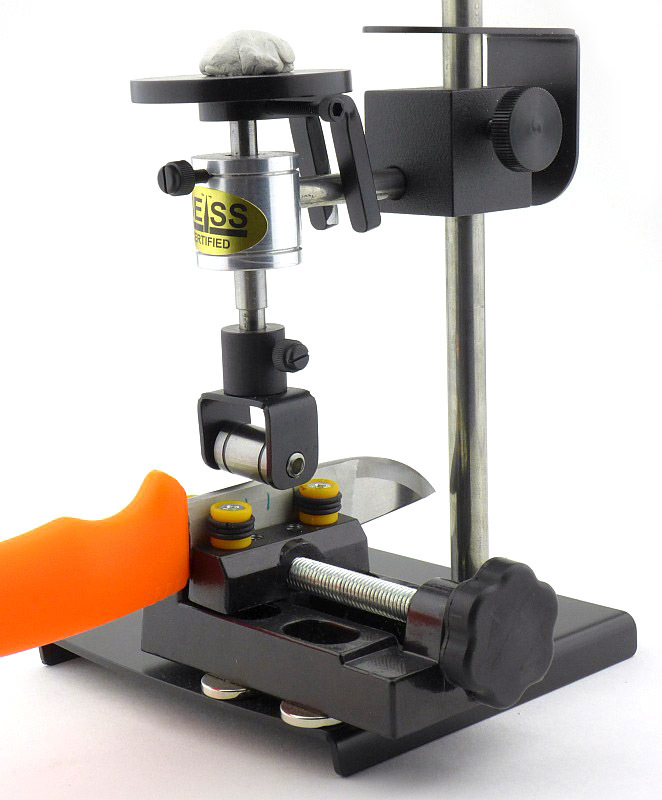 Once fully open the lock slides back forwards to lock the tool in place. 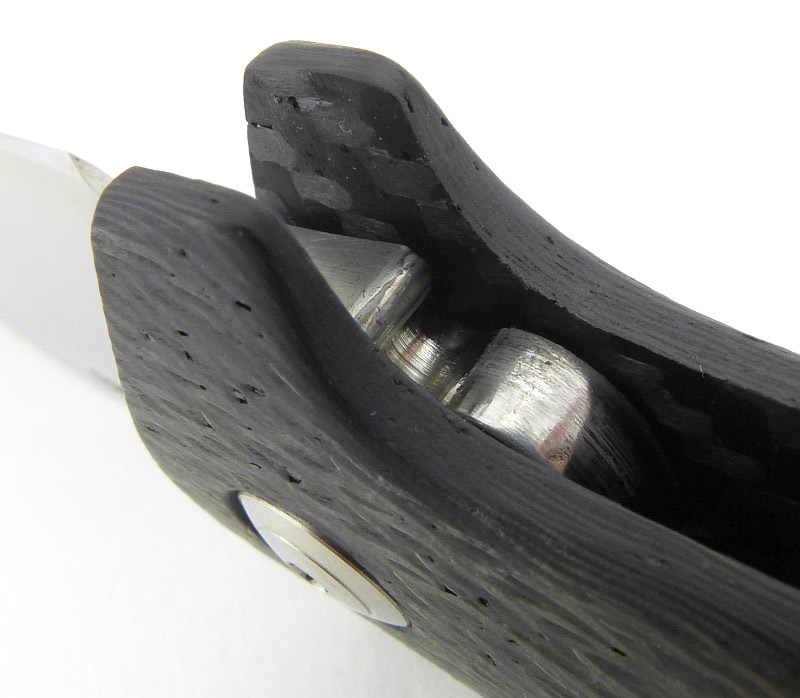 Then a multi-purpose prying tool / bottle opener. 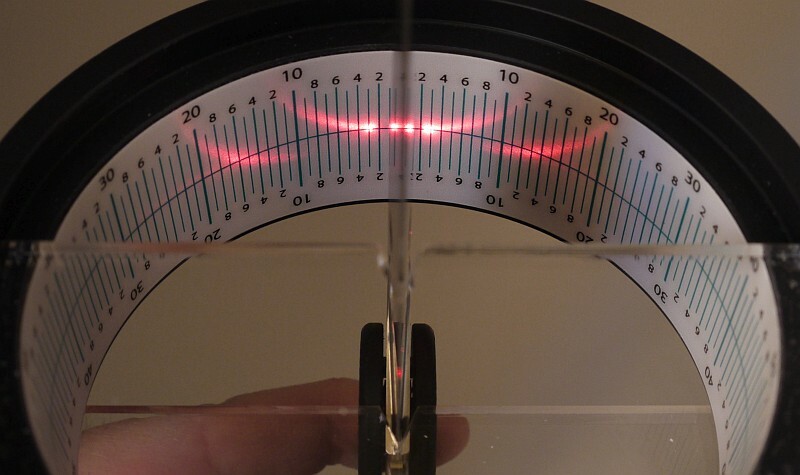 The other side of the prying tool. 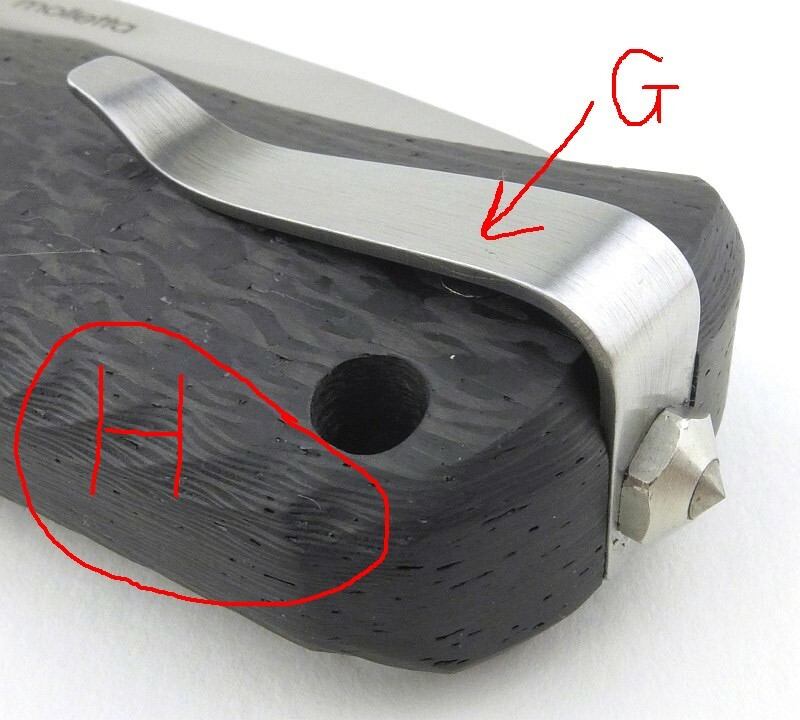 Even the edge bevels are black coated. Here you can see the lock spring with the lock engaged. 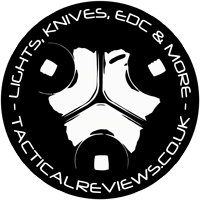 Having seen some less than positive comments about this tool, I felt the need to address these first before going into more on how I have been getting on with it. 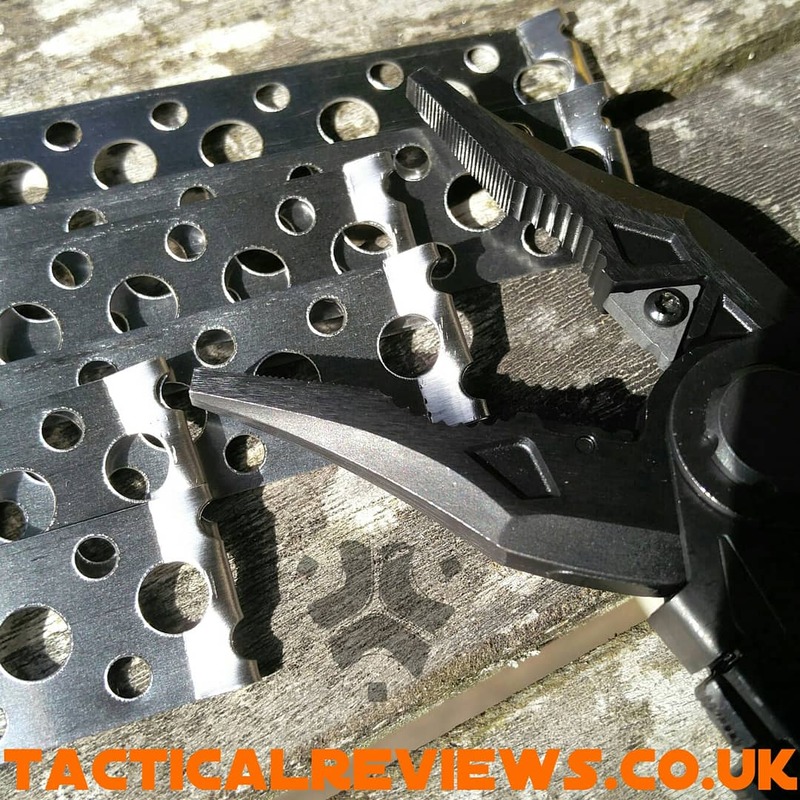 In particular I wanted to mention the often overlooked aspect that a multi-tool, by its very nature is a jack-of-all-trades and as such a-master-of-none. 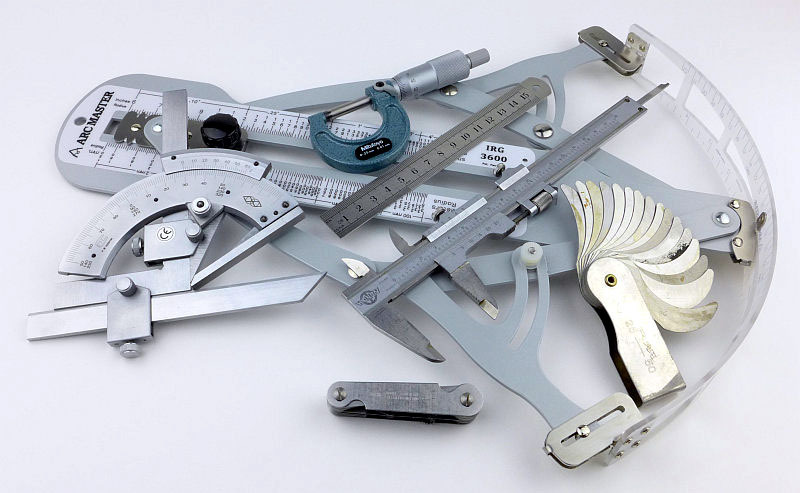 All tools have their limits and it is up to the user to apply appropriate force and use the tool in a reasonable way. 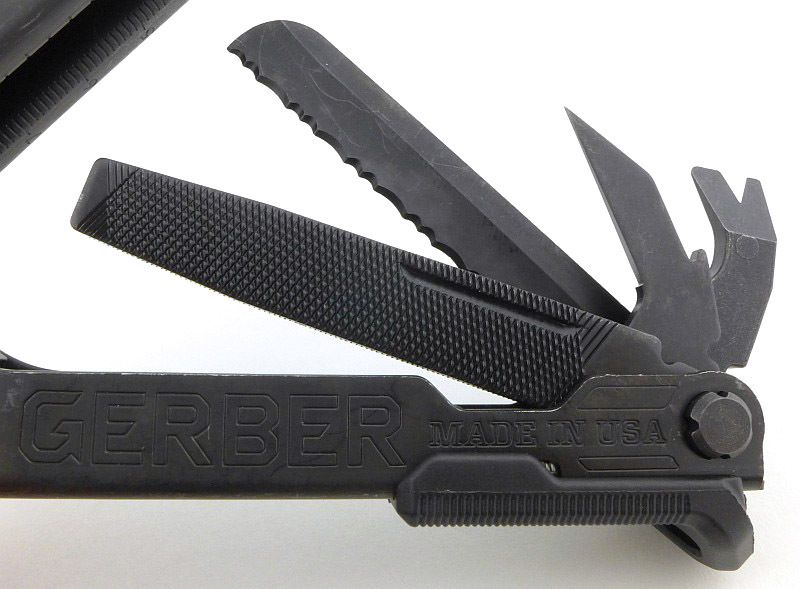 Multi-tools will get you so far, and are a tool-kit in one package, they can’t do it all. In every job I’ve used the Center Drive for I’ve not been trying to push it to its limits; heavy jobs need dedicated tools. Use it appropriately and enjoy the benefits. With that said, there is one design aspect you should be warned about. The knife blade has an opening hole for one-handed use, however there is a high likelihood you will cut yourself if you use it. 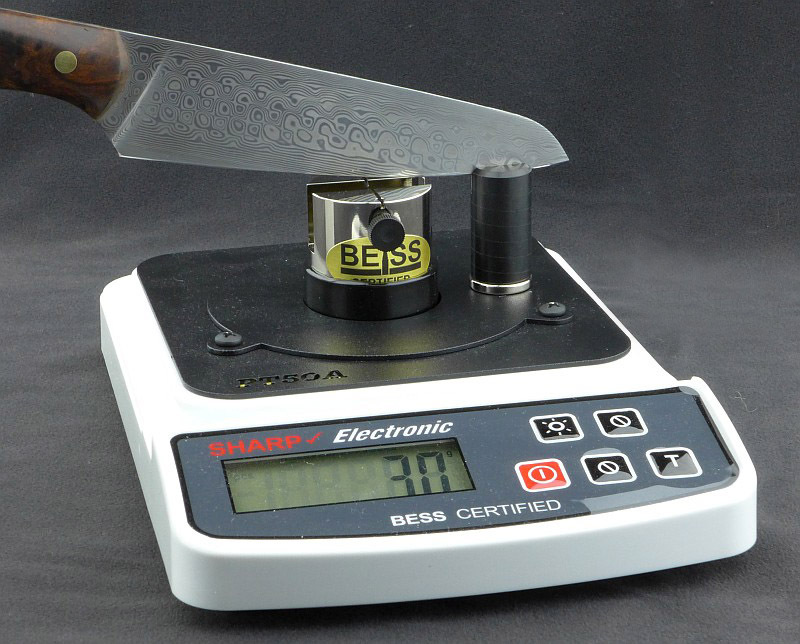 In the sample on test, the knife blade has a good resistance to movement (which helps keep it closed) and this requires a certain amount of force to rotate the blade open. 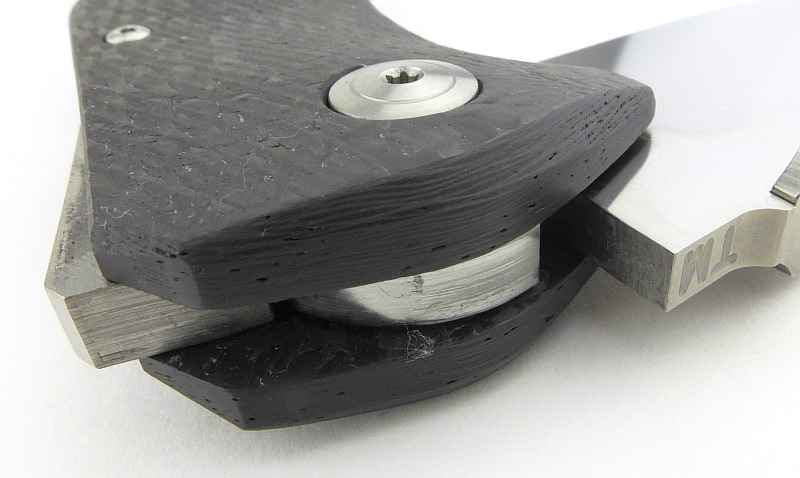 This amount of force pushes the thumb quite hard onto the side of the blade, so much so the cutting edge touches your skin. Initially I found small skin flaps forming on my thumb, then realised where they came from. Check the images I took from my Instagram posts on this in the gallery below an you will see what I mean. Excellent reach and usability of the main bit holder. 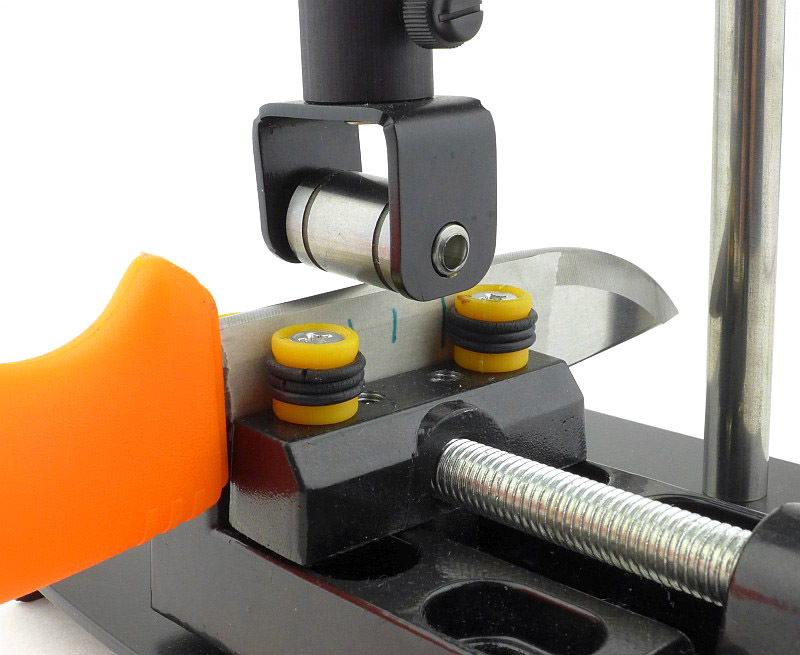 Sprung jaws make this very easy to work with. 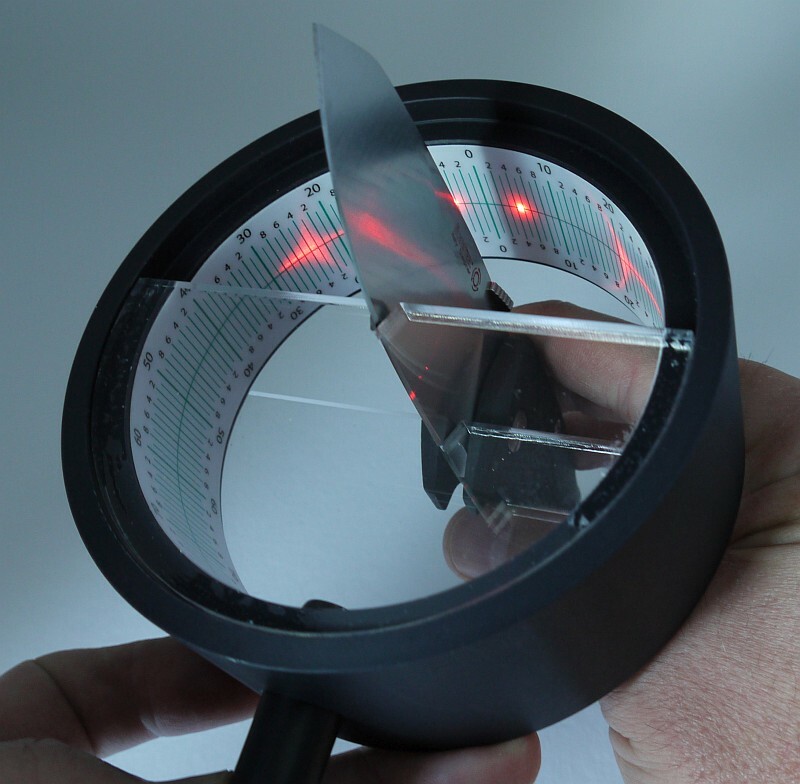 Watch that cutting edge when OHO! Oh so useful to have around. 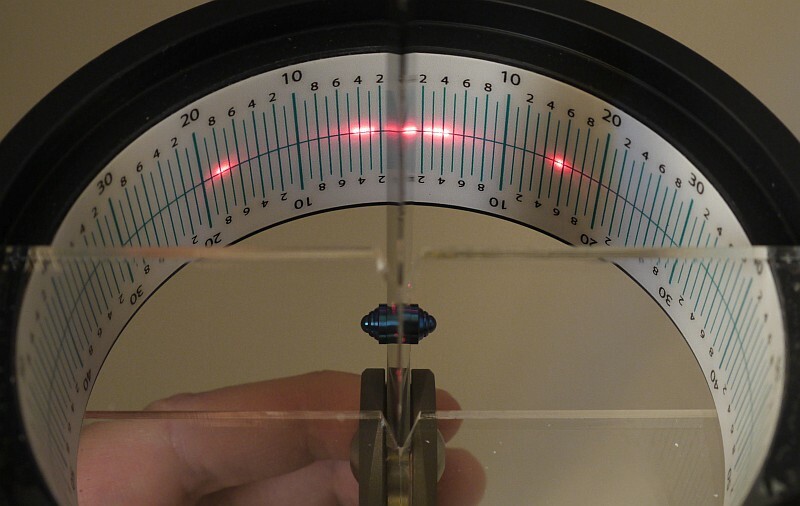 With all that out of the way we can look at what makes this tool particularly good. 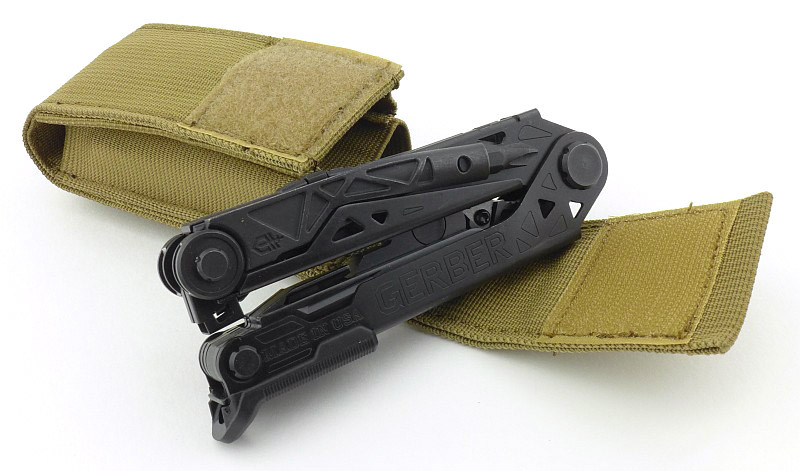 Personally, my main uses of a multi-tool, in order, are as a screwdriver, then the pliers, the file, pry-bar, awl, after which it depends on the tool, and as I carry a dedicated knife, using the multi-tool knife is generally only a last resort backup. So my most frequent need will be for the screwdriver tool, and the Center Drive has an extended, centred, standard 1/4″ Hex bit-holder. That is something to take in and consider. 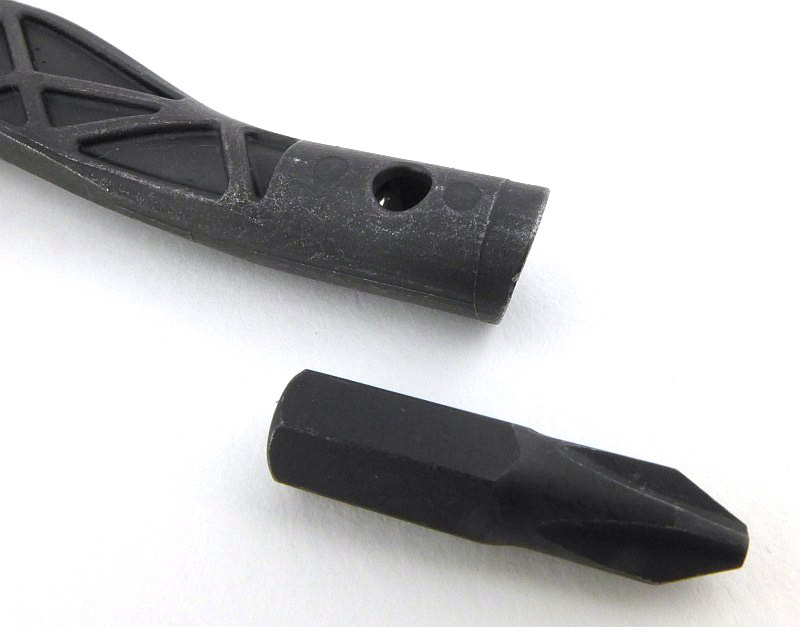 No special bits are required, any 1/4″ Hex bits you have can be used. 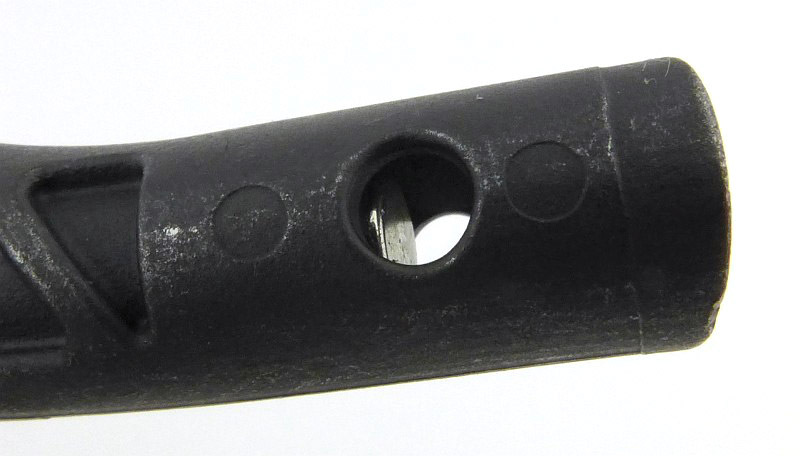 The first thing I did was pop a PZ2 (not supplied) into the bit holder as this is my number one bit type used. 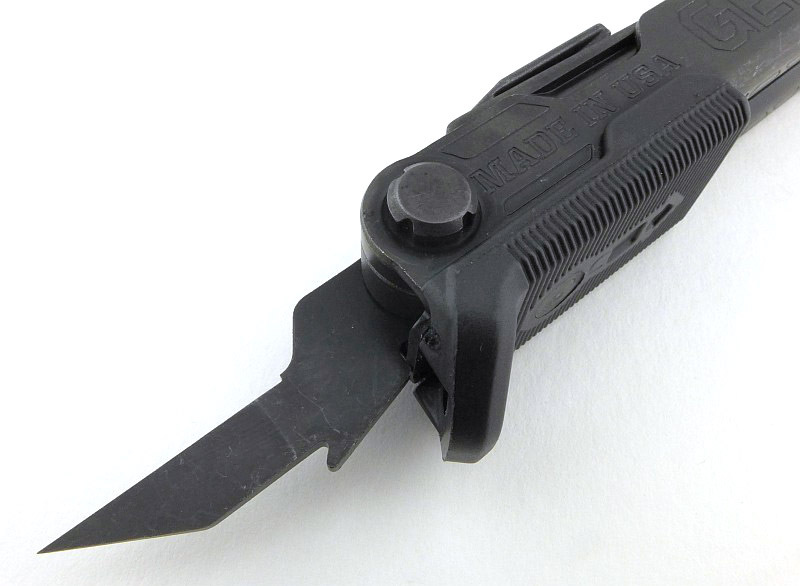 Multi-tool screwdrivers are often awkward to use as they are generally to one side or other and not that long; not so with the Center Drive. 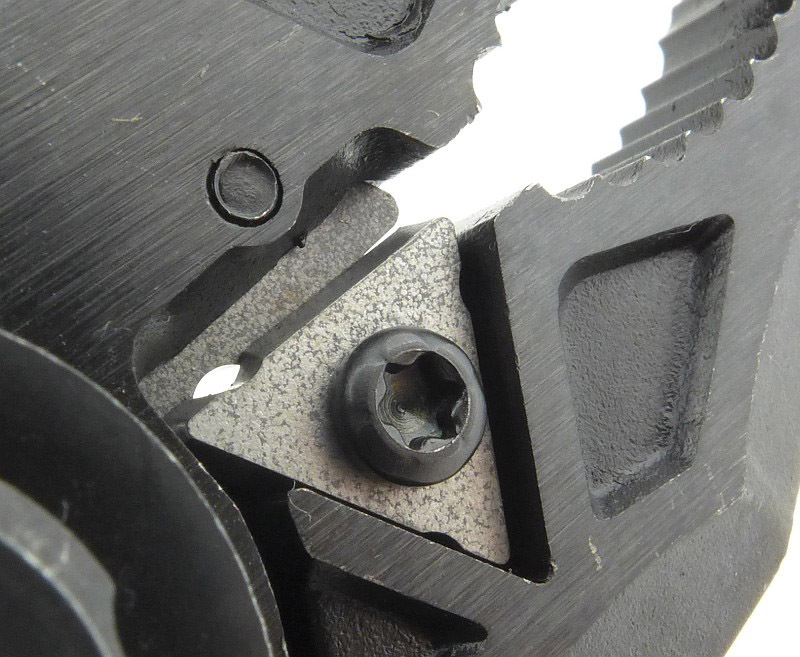 The extended bit holder make it so much easier to see the screw head, and access internal screws, or those near a corner. 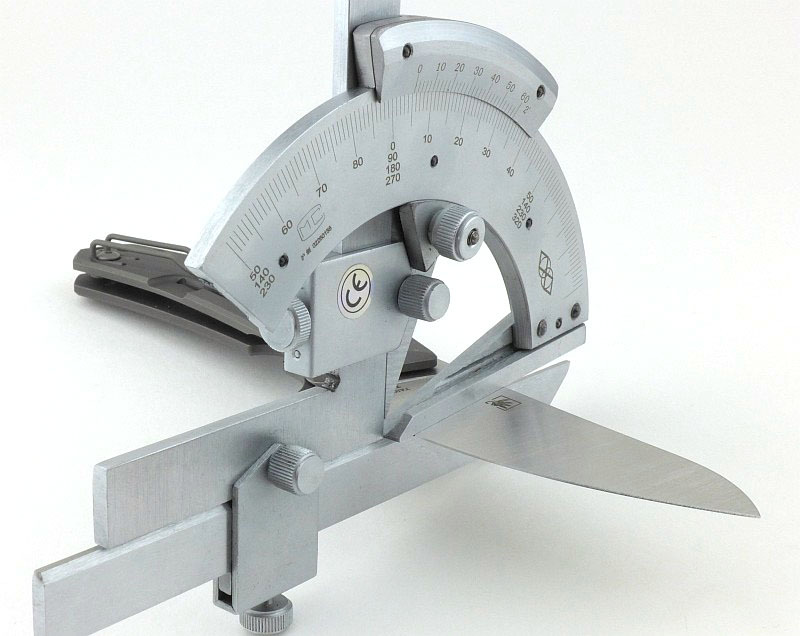 Clearly with a folding tool like this you can’t 100% centre the bit holder, but it is centred in relation to the widest part of the tool, and this makes it much easier to use. 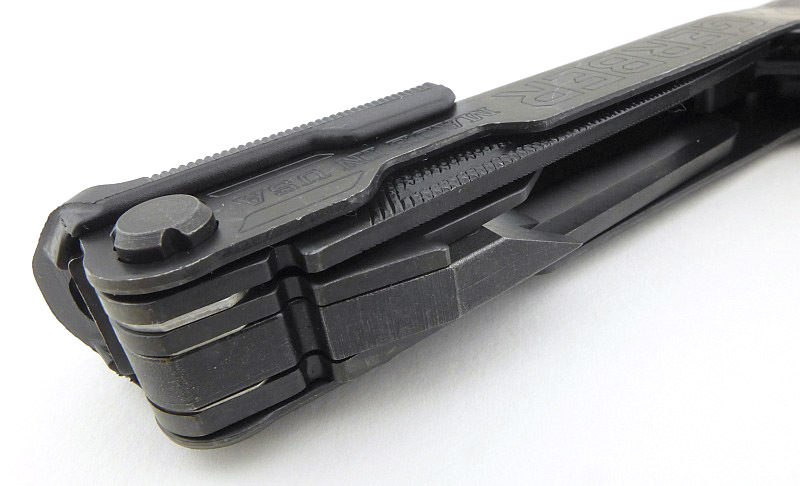 This is the best built-in multi-tool screwdriver I’ve used. Onto my second most needed tool, the pliers. Since I first used sprung pliers (probably some jewellers pliers), it makes non-sprung pliers seem a pain to use, especially when manipulating the work piece. 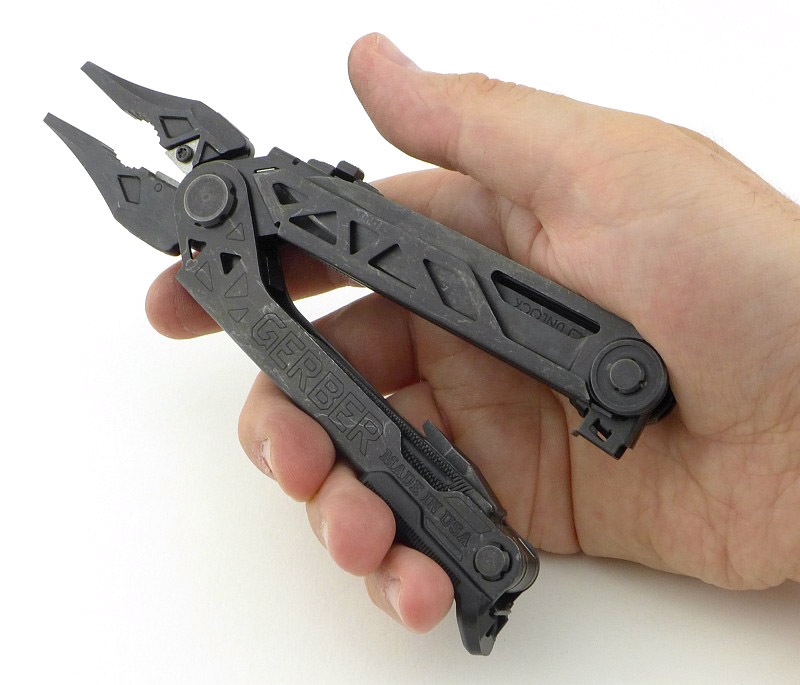 Having OTF pliers, the Center Drive is able to have sprung pliers (the unfolding type of multi-tool pliers typically have no spring), and thanks to the spring just become an extension of your hand, allowing you to focus completely on the work. 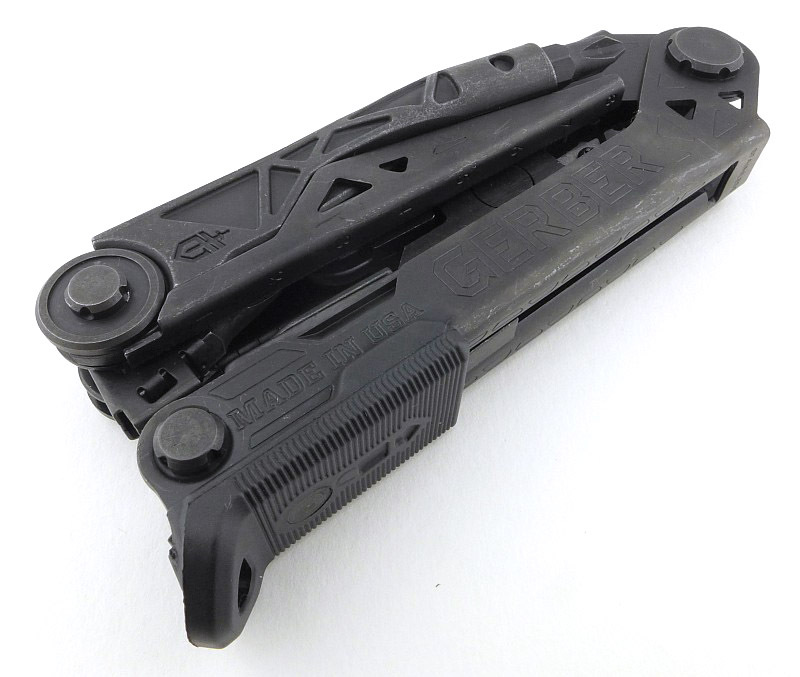 As you might expect from a multi-tool file, it is not that sharp, but it lets you take off those rough edges from softer materials and non-ferrous metals well enough. 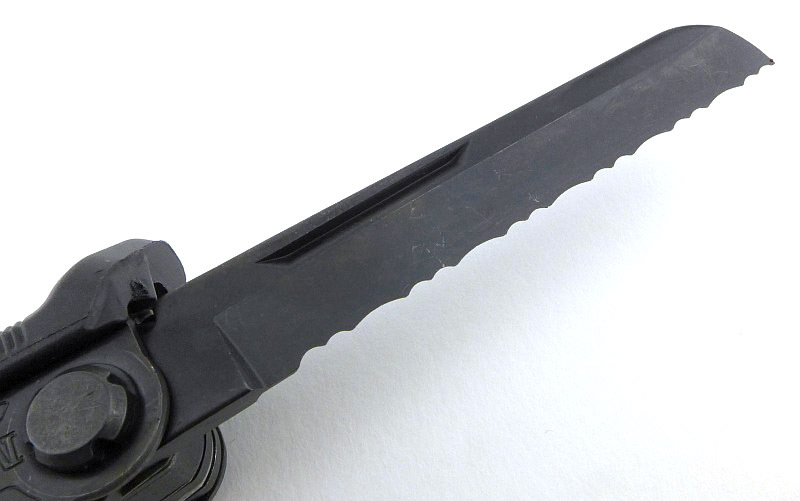 One disappointment is the serrated knife blade, which, in this example, is blunt. 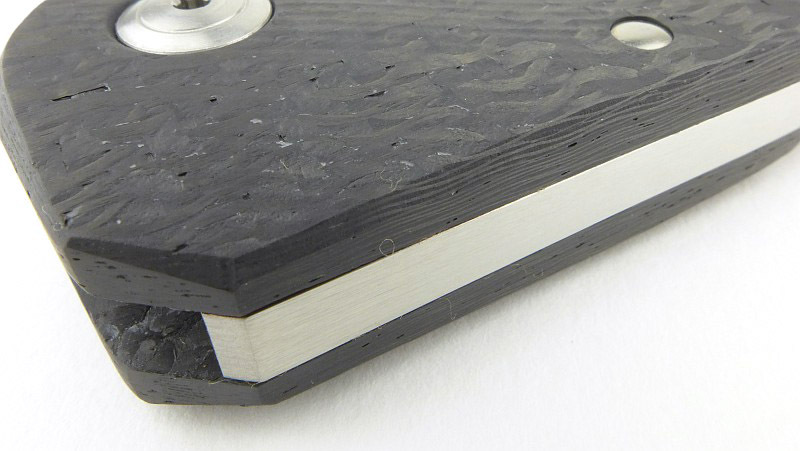 The cutting edge has the same black coating as the blade, making it appear as if it never got a final sharpen. 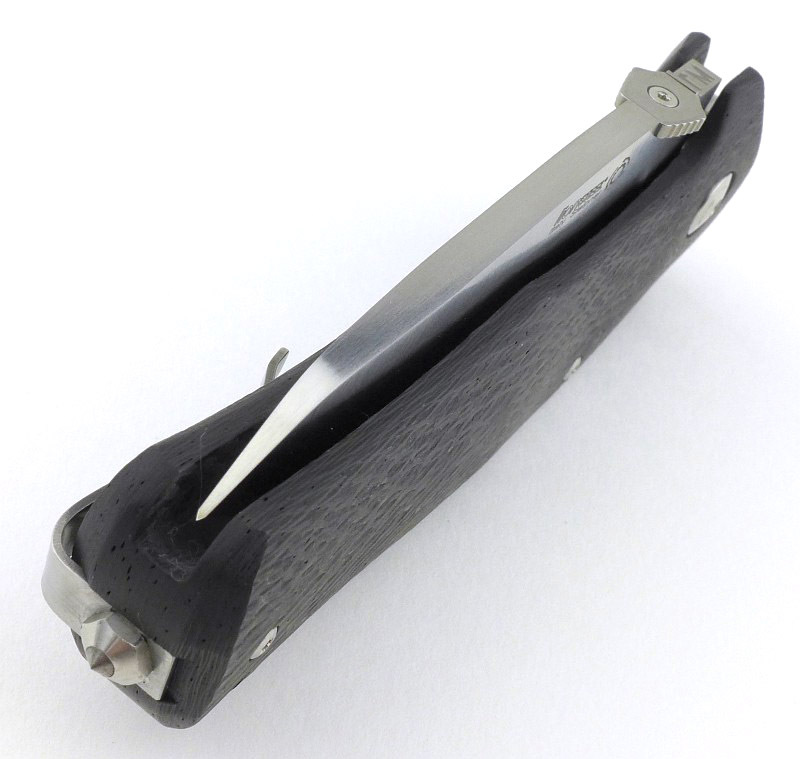 The awl has no sharp cutting edge, so is really just a metal spike, useful for all sorts of little jobs. 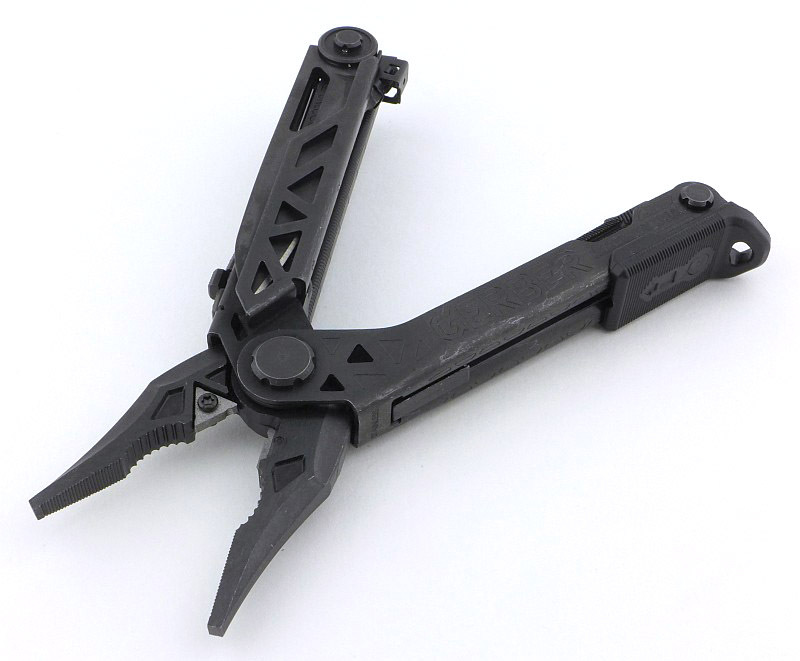 Next to this is one of the best prying tools I’ve seen on a multi-tool and will get into narrow gaps as well as being able to lift small nails. All of this is no good if you don’t have it with you. 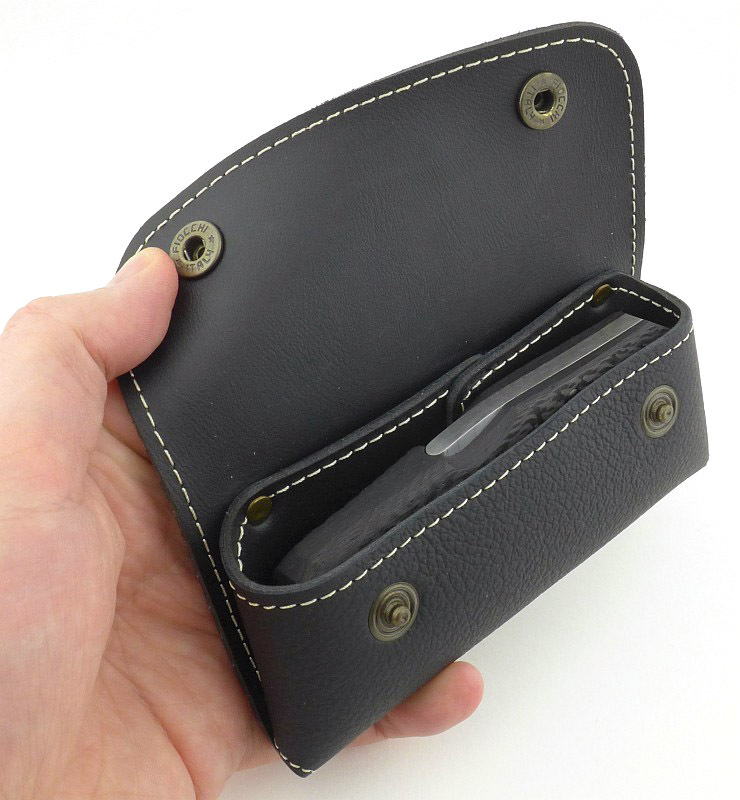 The included pouch has two compartments, one for the set of bits, and one for the tool. 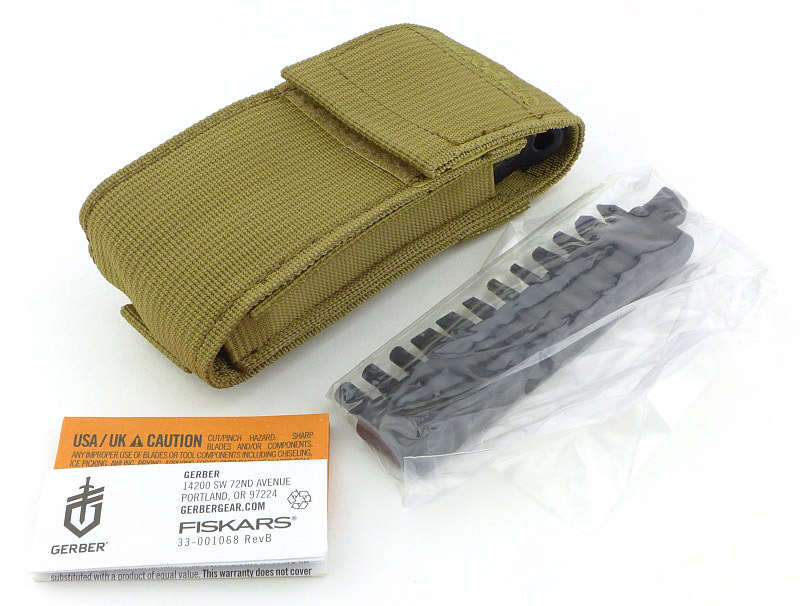 Should you want to go lower profile, you can leave the full set of bits out (still having two in the tool itself) and the pouch slims down – belt or MOLLE mounted you’ll have it with you. 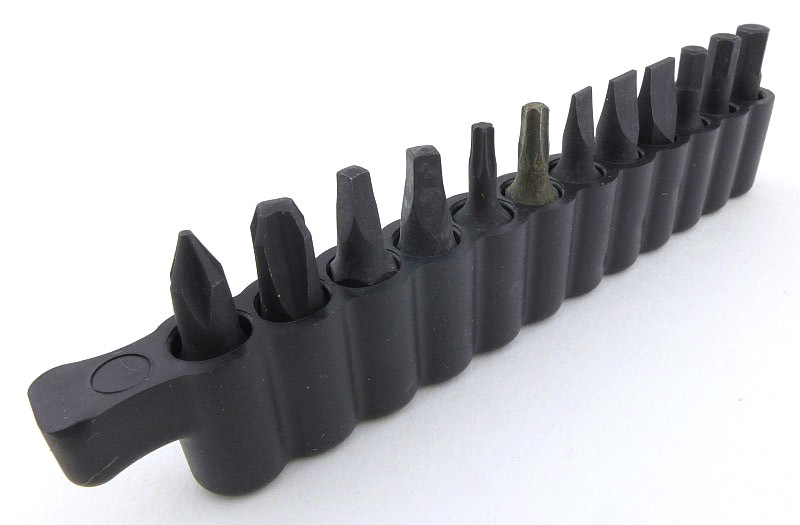 Centred, extended, 1/4″ standard Hex bit holder. 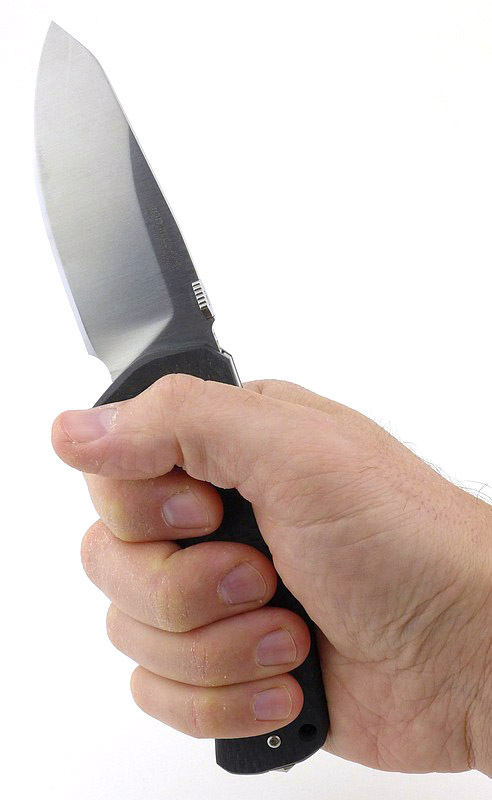 One-Handed-Opening the main knife blade can cut you.